My Mum has been telling me about this Nigella Lawson recipe for quite a while now, apparently it is a winner every time she cooks it and is also a one tray wonder and I love those, the less washing up the better. When I looked this up online I thought the original recipe looked great but there were a few tweaks I wanted to make. Not that I would ever second guess the lovely Nigella I can’t think of chorizo without adding red peppers so I through a couple in, I prefer wedges of roasted onions to chopped and I boned my chicken thighs and cut them into chunks to cut the cooking time and also so to ensure the crispiness of skin because I hate to waste crispy chicken skin. This was indeed a one tray wonder and I served it in the cooking tray because sometimes I can get away with saying I am being rustic when in fact I am being lazy. This will serve four and add a crisp green salad or some crusty, or GF bread depending on your mood, a glass of red wine would not go astray here. Preheat the oven to 200/gas mark 7/425f. When everything is mixed, turn the chicken thighs skin side up so the skin will crisp. Place the tray in the oven and bake for 40 to 45 minutes , making sure to stir and baste in the everything in the lovely chorizo flavored oil half way though. Check to make sure the chicken is cooked through and the potatoes tender before serving on the cooking tray or you could transfer to a warmed serving dish if you are feeling fancy. 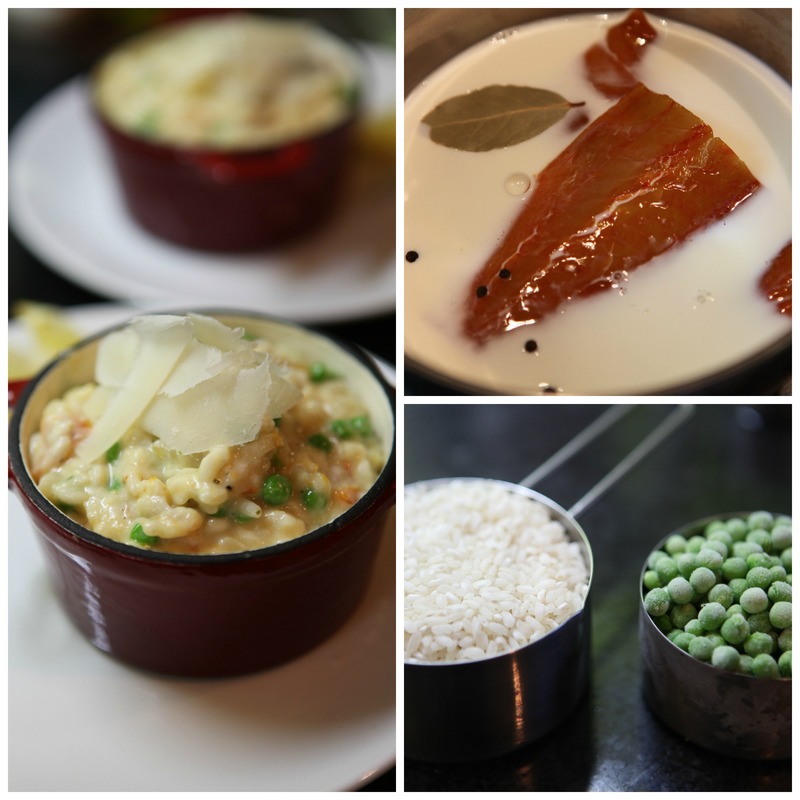 I always thought that risotto was up there with a soufflé in terms of the technical skill required for a good result. I was convinced I would get the texture wrong and I would end up with a dry and hard risotto. One day however my mind made the simple connection between the texture of a good creamy rice pudding and the correct texture for risotto, I am very fond of rice pudding, particularly served with a crimson swirl of strawberry jam so I have made it a point to learn how to make rice pudding whether baked, cooked on the stove top or microwaved. 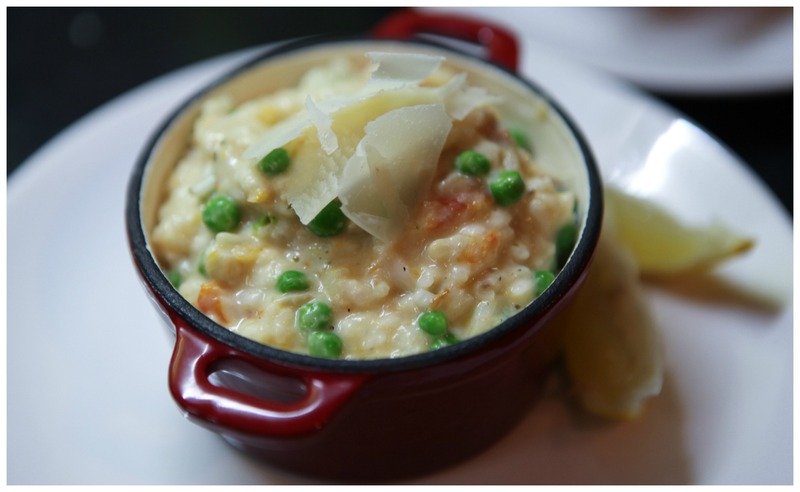 Once I had rice pudding as a reference point I was much more confident in approaching risotto. Risotto is one of the perfect comfort foods, it can be cooked in a near meditative state, standing by the heat of the stove, wine glass in hand, listening to music, stirring intermittently, while you are lulled in to a relaxed state because risotto cannot be rushed. It is creamy, savoury and can be as basic or as complex as you like depending on your mood. This risotto was pulled together from the ingredients I could find in Aldi late one Sunday evening and the result was much more luxurious than the cost of the ingredients would suggest. This kind of dish is great for a Sunday evening supper, particularly if you have indulged in brunch and have no mind for a proper dinner. The ingredients here made for two hearty two portions with enough left for seconds. Once you have used all the stock remove the fish from the milk strain the milk and start adding to the rice, ½ cup at a time. Continue until the rice is almost completely cooked through with a creamy consistency, this should take about 35 to 40 minutes. Flake the cooked fish, removing any bones and the skin and then add to the rice with the petite pois, lemon zest and juice, stir gently to combine without breaking up the flaked fish, let this sit for a few minutes until the peas and the fish are warmed through. The rice should be tender and at this point you are ready to serve. Check for seasoning but depending on your fish and stock you may not need extra salt. Spoon into bowls and top with large shavings or parmesan cheese and some fresh ground black pepper, serve with a wedge of lemon and the remainder of the white wine. This is barely a recipe but it is something I love to eat when I am craving something with the texture of a good old fashioned chicken burger or chicken wrap. Nowadays I forgo the bun or tortilla wrap in favour of a butterhead letture leaf having seen this nifty idea used for Korean Wraps. The lettuce allows you to pile lots of falvours into one tasty package but without overwhelming the taste or texture which I find can sometimes happen with gluten free bread products. 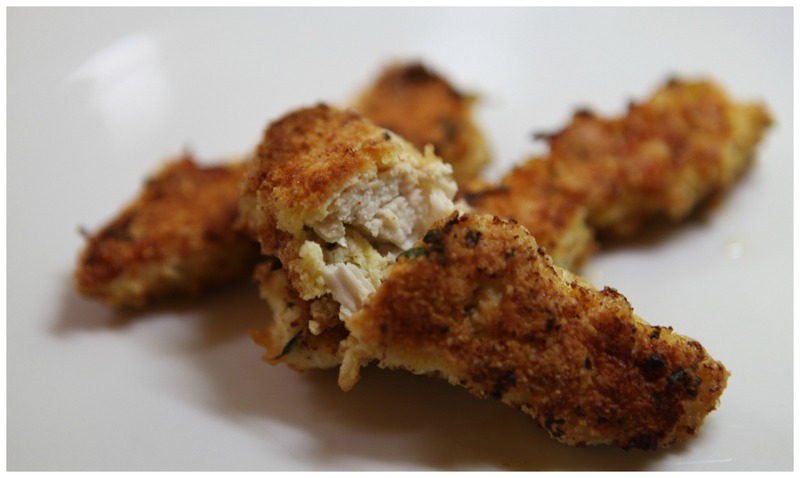 These grain free chicken strips would also be a great finger food at a party and served with mashed potato or homemade fries would also please the palate of even the fussiest celiac child or adult. I first starting using ground almonds (almond meal) to coat chicken when I found I always seemed to have a few tablespoons left over in the end of a bag and didn’t want it to go to waste but it has since become my preferred option. You can flavour this with any herbs or spices you like, a little GF cajun spice or some Old Bay Seasoning would be perfect. You can forgo the coconut flour altogether or use corn flour instead if you aren’t keeping grain free but I find that dredging the chicken in a little flour gives the eggwash something to cling to. The amount here was enough to cover 2 large free range chicken breast cut in to strips but you can adjust by adding a little bit more of each ingredient if you feel like you are about to run out. You could also bake these in the oven if you are more health conscious than I am but I absolutely love the flavour of the pan fried version. Place the chicken breasts between two pieces of cling film or parchement paper and beat with a rolling pin until the flatten out, you don’t want the chicken too thick or the crumb will burn before the chicken is cooked through. Heat your pan over a medium high heat and coat the base with oilve oil, when the oil starts to shimmer gently add the chicken strips, a few at a time as you don’t want to crowd the pan. Allow to cook for four minutes on each side before turning them over and cooking for another four minutes. If you feel like they are browning too fast reduce the eat under the pan. Check for to see if they are cooked through be slicing in to the thickest part of the one strip, if they are fairly uniform in size they should all cook in the same time. Place the cooked strips on a plate in a warmed oven while you fry the next lot, adding more oil to the pan with each batch and continue until they are all cooked. Serve with salad and cheese in a wrap or a bun, with fries or mashed potatoes or simply on their own with a green slad or even more simply with some dipping sauce to be nibbled on while enjoying a chilled Gluten Free Beer. Apologies for the lack of a post last week, I took an impromptu holiday for St Patrick’s Day! There is an amazing variety of fruits and vegetables available in Ireland right now and occasionally I get a bit annoyed at myself for not taking more advantage of this new bounty. It is easy to fall in to a trap of knowing what you like and the best ways to prepare that but I want to try new tastes and find new favourites. I was in a market recently and found myself staring at Kohlrabi and wondering what could be done with this pale green slightly alien looking vegetable with its trailing green leafed stems. Having done a bit of internet research and finding that the flavour was good in coleslaw I decided to try mixing it with some celeriac in a remoulade, at least that way I figured if the flavour wasn’t great it would be mostly disguised by the mustardy mayonnaise dressing. For extra flavour and texture I added a crisp granny smith apple. Kohlrabi smells like broccoli and has a somewhat similar flavour but the texture is more akin to the watery crispness of watermelon and is nicely refreshing and I can see why it is added raw to summer salads. You can cook the leaves as you would spinach but mine were a bit wilted so to the compost they went, there is a tough outer skin which is easily peeled away. 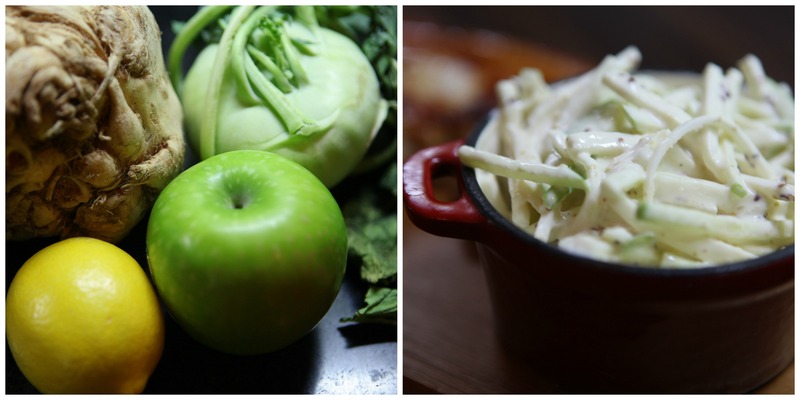 This trio of celeriac, apple and kohlrabi worked really well together and the resulting remoulade was a great side to serve with a good thick pan fried pork chop and I think it would be excellent with sausages, black pudding or pulled pork. Peel the kohlrabi and slice thinly, stack the slices and cut in to thin strips, repeat the process with the celeriac and the apple but leave the skin on the apple for a bit of colour. In a bowl mix together the mayonnaise, mustard and the lemon juice. I like a good punch of heat from my mustard and a sharp dressing so I add a lot of mustard and lemon so here is where you need to start testing the dressing as you are mixing. Start small and then keep adding and tasting until the dressing tastes right to you. Once you have the ratio of mayo to mustard to lemon correct then add salt and pepper to taste. Place the thinly sliced vegetables and apple in a bowl and pour over the dressing, mixing until everything is well coated. 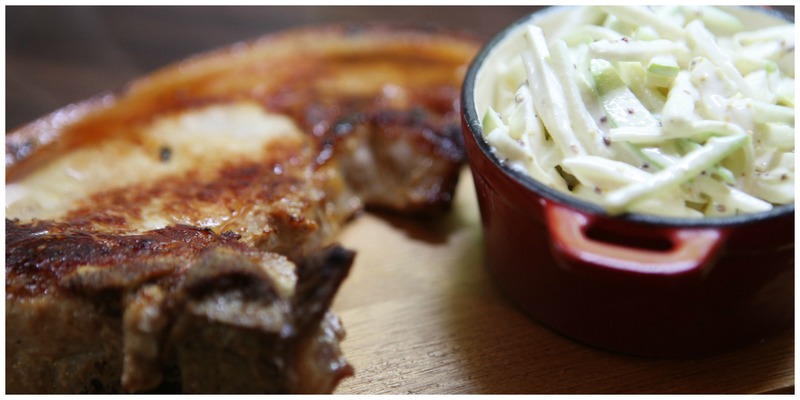 This is less a true remoulade than a slaw with a remoulade style dressing but it is crisp, bright, creamy and full of flavour, serve with your meat of choice as a side or tucked in to a hearty sandwich. I left work late last night , it was dark and miserable and by the time I made it to the supermarket the the vegetable shelves were depressingly empty, there were a few sad, wrinkled aubergine and a couple of peppers and something about them sitting there, unwanted at the end of the day inspired me to make something glorious and tasty out of them. 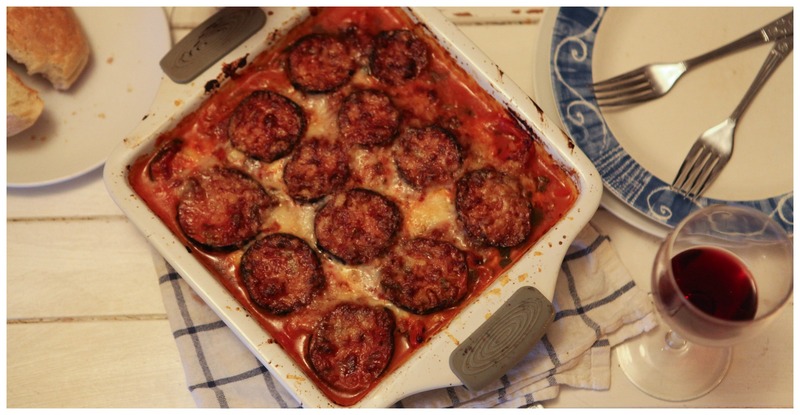 Eggplant, or aubergine as we would say in Ireland, parmigiana is not a dish for anyone with an aversion to cheese, it is however hearty and delicious and has a promise of Summer in the bright red of the peppers and the tomato sauce. When cooked the top should be golden with bubbly melted parmesan and each layer you spoon out should pull strands of gooey melted mozzarella with it. I always expect that the dish will take longer to prepare than it does and this always puts it out of my list for mid- week dinners however it actually takes only about an hour in total, 30 minutes to prep and 25 minutes to bake, so once you have the prep done and the dish in the oven you have just enough time to shower, wash of your make up or just climb in some comfy pyjamas while dinner bakes, or if you have a lot more energy than I do of an evening you can set the table, open the wine and light some candles as this meal is great for either a cosy dinner on the couch or a romantic meal for two. This is also great for a casual dinner party, put the dish straight on to the table in the along with a green salad and lots of crusty bread or good Gluten free bread if you are celiac and let everyone helpthemselves. 3 150 gram packs of mozzarella, if you are feeling spendy use a good brand but I was being frugal and the €0.59 Tesco mozzarella was absolutely fine. Remove the stalk from the aubergine and slice in to 1 cm slices, lay the slices on a baking sheet lined with kitchen paper and sprinkle with salt, leave for a few minutes while you prep the rest of the vegetables. Peel and finely slice the onion and then finely slice the red peppers, peel the garlic. Heat a tablespoon of oil in a pan over a medium heat and add the onions and peppers, cook slowly as you want them to soften but not brown. Grate in the garlic and allow to cook over a low heat. Take another sheet of kitchen paper and press over the aubergine to absorb the liquid that has been drawn out by the salt. Cover the base of a wide bottomed pan with about 1 cm of olive oil, heat over a medium high heat. Add the aubergine slices, a few at a time as you don’t want to over crowd the pan, cook for a few moments untilt he base is golden and then turn the slices over. Once each slice is cooke place it on another tray lined with kitchen paper, to absorb the excess oil. Continue this process, adding more oil to the pan as necessary until all the aubergine slices are cooked. Take an oven proof baking dish and spoon a layer of the tomato sauce on the base of the dish, add a layer of fried aubergine and then spoon over half of the onion and pepper mix, next layer will be the finely sliced mozzarella and then another layer of tomato sauce, repeat this process of aubergine, onion & pepper mix, mozzarella and sauce until you have one final layer of aubergine, cover this with the remaining sauce and then grate over a thick layer of parmesan cheese. Place the dish in the oven and bake for 25 minutes or until golden and bubbling. Allow to settle for a few minutes and then dig in! 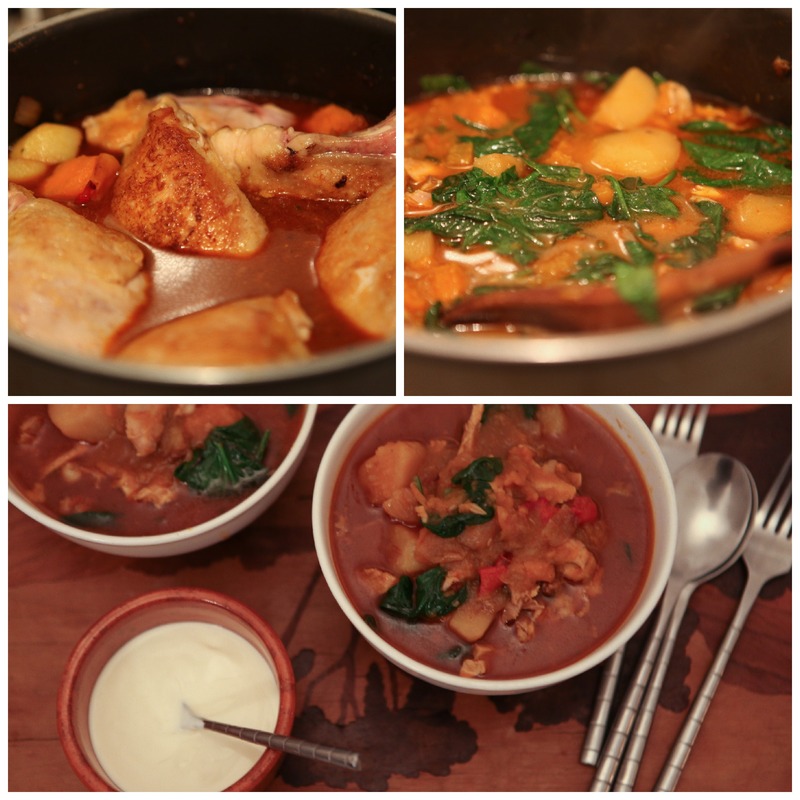 While it is still very much winter out there I am starting to crave the tastes I associate with Summer, fresh ginger, coriander and the happy fresh zing of lime juice but being that is absolutely bitter out I wanted to find a way to combine these flavours in a warming winter stew. What I came up with is a mishmash of a few of my favourite recipes, one of those being the Hill Station Curry from Alastair Hendy’s stunning book Asia, this calls for the addition of potatoes to the finished curry and what could please my Cork Irish soul better than that. If you time it well this is a really simple and quick dinner and while I had enough carbs in the potatoes you could always boil some basmati rice to bulk this up and make it stretch. This was more than enough for 2 good dinners with leftovers for 2 lunches the next day. 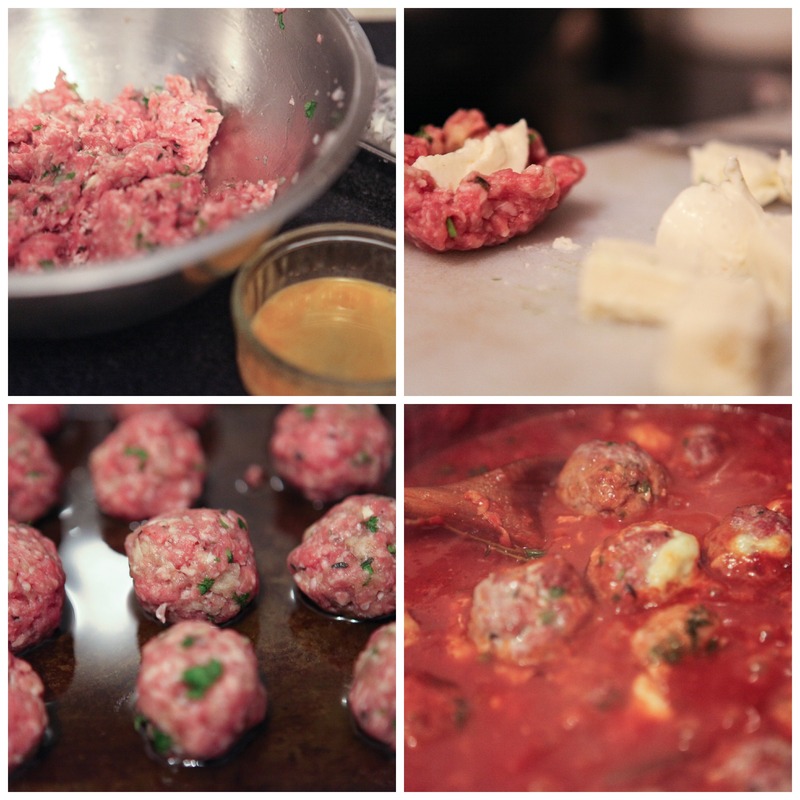 Place all of the meatball ingredients in large bowl and mix until thoroughly combined. At this point you can put your potatoes on to boil in plenty of salted water. Add in the rest of the ingredients, at this point add only the juice of half the lime, you can always add more later. Bring to the boil and then reduce the temperature and allow to simmer for 15 minutes. At this point your meatballs should me almost cooked through and the potatoes tender so you can remove them from the heat, drain the water from the potatoes and have them both ready to add to the broth. Use a slotted spoon to remove the solid ingredients from the broth and add 2 teaspoons of honey, taste for seasoning and then adjust the sweet / sour ratio with lime juice and honey until you get the flavour you want. Spoon the stew into bowls, over rice if the weather demands double carbs and curl with this warm winter stew made with summer flavours. Well January is doing a great job of kicking all our asses isn’t. After a lovely break for Christmas I was all set to start back posting last week and then I woke to the terrible news that David Bowie had died and I just wanted to climb back in to bed, pull the duvet snug around me and listen to all his albums. By the end of the week, having just started to get used to a Bowieless world I clicked on a cryptic tweet teasing that something else horrible had happened only to be brought to the Guardian obituary for Alan Rickman and again the strong urge to just be done with the day hit me. There isn’t much you can do when two of your heroes, crushes who have lasted from teen years to adulthood, two men whose voices you recognise at the first word they utter have passed away other than allow yourself a good cry, find sustenance in the treasure trove of work they left behind and eat something comforting that requires little effort. I received two lovely cookbooks for Christmas and one of them is Nigel Slaters Notes from the Larder which is one of the most comfortable cook books to sit and read. You can hear hushed tones in every word. The recipes are sorted by month and trying to be seasonal I chose to cook the first soup in the January section which was a Celeriac and Bacon soup. Once a difficult and pricey vegetable to find, celeriac is now easy to source and I found mine in Aldi for €1.49, a bargain given the long lean month that is January. This soup is warming, flavoursome and has an interesting texture due to the addition of wholegrain mustard. I adjusted the recipe slightly to use shallots instead of onions as and a packet of diced pancetta instead of smoked bacon as that is what I had to hand and one of my 2016 kitchen resolutions is to use up every last scrap of food I can before going grocery shopping! I got two hearty dinner portions from this soup with enough left over to freeze for three lunches. 800grams of celeriac (one average sized celeriac was 830 grams unpeeled), peeled and coarsely grated. I used a regular box grater for this. Fresh Thyme leaves, about 2 teaspoons. I keep my thyme in a box in the freezer and the cold causes the leaves to fall off the stalk keeps them fresh, it is the only way to keep thyme. • Melt the butter in a large heavy bottomed pot over a medium heat. • Add the chopped shallots or onions and cook until soft and translucent , about 10 to fifteen minutes. • Use and immersion blender to liquidise the soup. If you don’t have one of these handy gadgets then use your blender and blitz the soup and few ladles at a time, taking care not to splatter yourself or your kitchen with molten soup. • Now is the time to add a few tablespoons of double cream however the soup has a silky texture and doesn’t really need it. Serve with the best Gluten Free bread you can find and if you aren’t celiac with some good crusty bread while watching Truly Madly Deeply for the umpteenth time or while listening to your favourite David Bowie tune. Something about long grey rainy evenings is most conducive to playing board games. Whether propped up on cushions in front of a fire with the board set up on the floor to play Cluedo or sitting bolt upright, full of concentration around the dining table for more serious strategy games with several players, playing games is my second favourite way to while away any day that is too miserable for outdoor activities. My most favourite involves a couch, blanket and many dvd’s. There isn’t much you can do to improve on an afternoon spent drinking wine and plotting the downfall of your friends but popping a slow cooking casserole in the oven so that your house starts to smell distractingly good about an hour in to game play is a definite plus. Add to that the fact that slow cooked meat is so tender that you can eat dinner with a fork in one hand while still holding your cards in the other and you have a recipe for a great evening. Take a deep sided casserole dish or roasting tin and brush it with olive oil, this will make cleaning a bit easier. If your dish is too wide and shallow the liquid in the casserole may evaporate which might cause the ingredients to scorch. If you are worried this might happen you can check throughout the cooking time and add more water if necessary, tilting the dish to make sure the cooking liquid is evenly distributed. 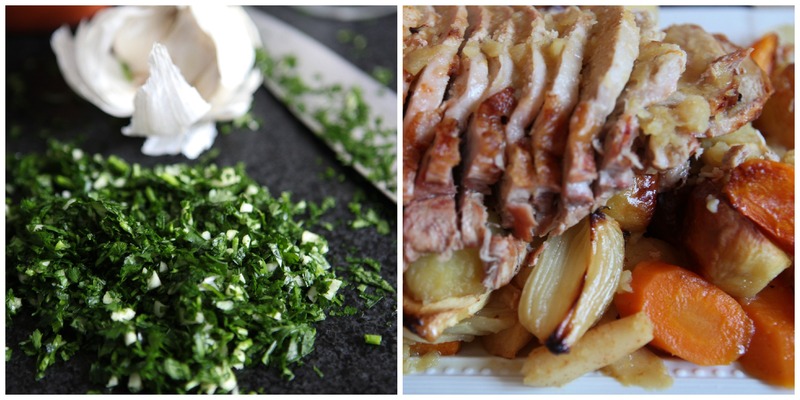 Place the potatoes, lamb, onions, parsley and cumin seeds in the dish. I add any bones that may have been in the chops for a bit of extra flavour, you an remove these before serving. Pour over the olive oil, season with salt and pepper and use your hands to mix the ingredients. Spread everything out to cover the base of the dish. Layer the tomatoes over the other ingredients and then dot the butter over everything. Pour the 1.4 cup of water around the edges of the dish and cover the top tightly with tinfoil. Place in the4 preheated oven for one and a half to two hours, checking every now and then to make sure the liquid hasn’t completely evaporated, is necessary add a bit more water. When the lamb is tender enough to be cut with a fork and the potatoes are cooked through, remove the tin foil and raise the oven temperature to 200 / Gas 6 / 400. Cook for twenty to thirty minutes until the edges of the potatoes start to crisp and turn a lovely golden brown and the cooking liquid has evaporated to leave a fairly dry but still succulent casserole. This dish, fragrant with cumin and with the concentrated flavour of slow roast tomatoes is delicious served with a wedge of lemon which just brightens up the lamb and maybe if it is a particularly miserable day some good bread. It is truly Autumn out there, leaves are turning and there is a definitely chill in the air first thing in the morning and in the evening. The days are shorter and it is dark when I leave for work and dark when I get home so it is definitely time for comfort food. Pies are always comforting, fruit or savoury, encased in pastry or topped with mashed potato there is something lovely and reassuringly cosy about taking a pie dish out of the oven with the pie filling bubbling up through the golden crust and over the sides of the dish. Shepherd’s pie is not glamourous but it is the perfect meal to follow a long walk in the crisp Autumn air, it is the kind of dish for a casual dinner party where you just place the pie in the middle of the table with a big serving spoon and let people help themselves. This is also a great dish to cook for celiac friends because as long as the stock cube is gluten free then the whole dish is. • Place the cubed potatoes in a sauce pan and with one teaspoon of salt, cover the potatoes with water and bring to the boil. • Once boiling pour out a third of the water and cover to pan. Reduce the heat to medium low and allow the potatoes to cook until tender. • While the potatoes are cooking make the filling. • Once cooked through drain the water from the potatoes and allow them to dry out a bit over a very low heat for a moment or two. • Add the two ounces of butter, the milk, Dijon mustard and one teaspoon of salt and a good grinding of fresh black pepper and mash the potatoes. Cover them with a lid to keep them warm until you need them. 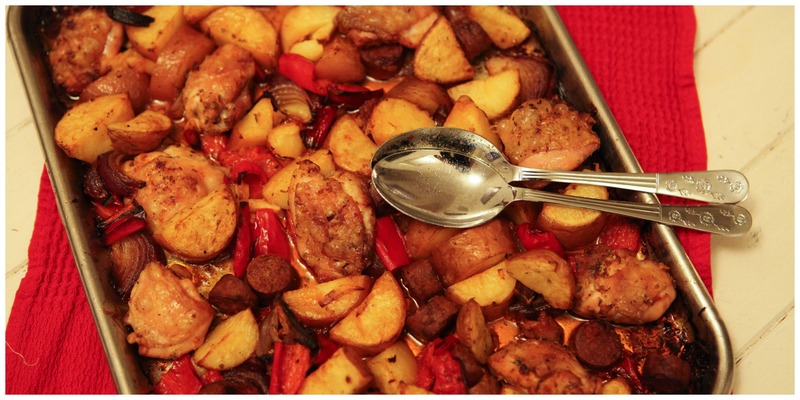 • While the potatoes are simmering away place a deep saute pan over a medium heat and add one tablespoon of oil. • Add the onions, carrots and celery to the pan and cook until the onion is translucent but keep the heat low enough that the vegetables do not brown. 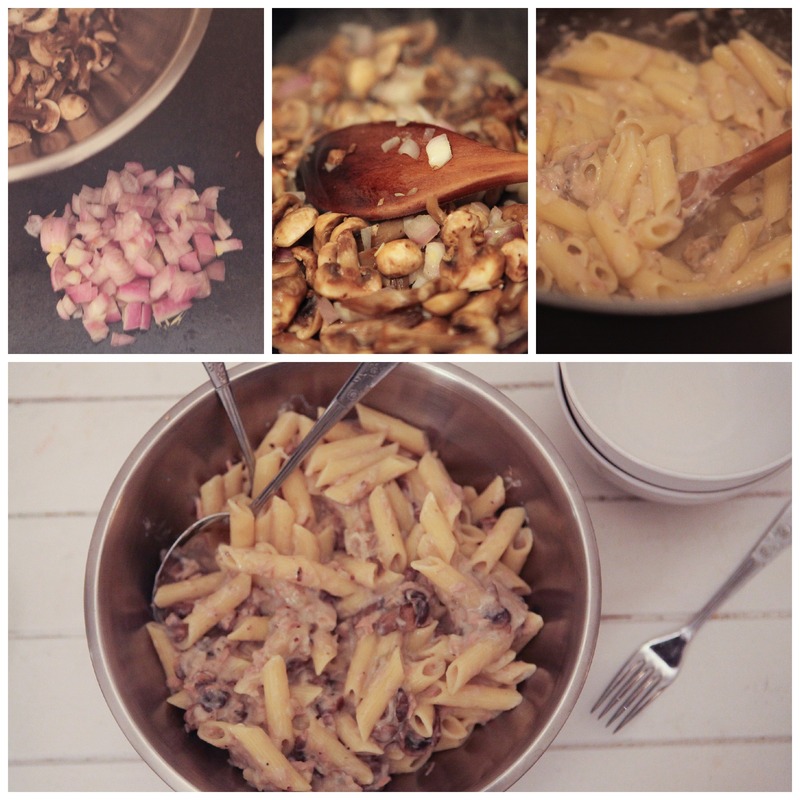 • Add the mushrooms and cook, stirring every now and then until the mushrooms are cooked and starting to brown. • Add the mince, breaking it down with a wooden spoon and cook until fully browned. • Add the salt, pepper, bay leaf and the teaspoon of fresh thyme leaves and you can throw in the thyme stalks for a bit of extra flavour. A good tip is to keep your fresh thyme in a bag in the freezer as this will cause the leaves to fall off and you will not have the very tedious task of plucking off the leaves. • Allow the sauce to bubble up for a minute before reducing the heat and leaving to simmer uncovered for twenty minutes. • Pour the sauce in to a 9” x 9” square casserole or pie dish, or any dish that will hold a similar volume. • Using a spoon dot the mashed potatoes gently over the filling and then use a knife to smooth out the potatoes until the filling is fully covered. 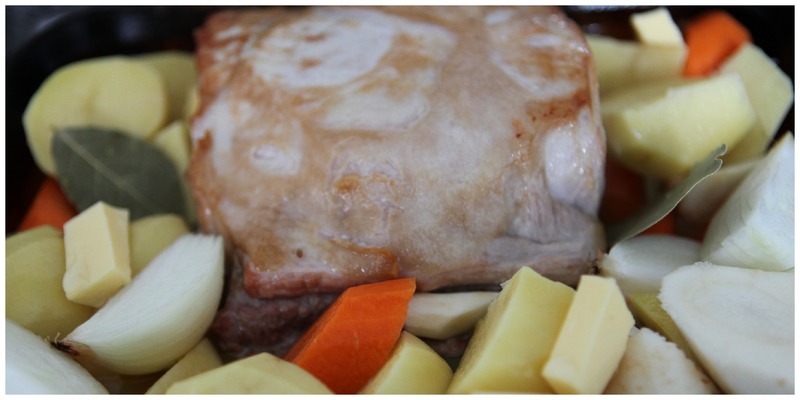 • Run the tip of a fork over the top of the potatoes sop you get ridges which will crisp up nicely in the oven. • I chose not to in this instance but if you feel the need now would be the time to sprinkle over some sharp cheddar, gruyere or parmesan cheese. • Place the pie in the preheated oven and leave to bake for twenty to twenty five minutes until the top is golden and the tomato sauce is bubbling up around the edges. It will save you cleaning the floor of your oven if you place the pie dish on a baking tray as the sauce is almost guaranteed to bubble over. Leave the pie to sit for about fifteen minutes before serving, you should get six portions. 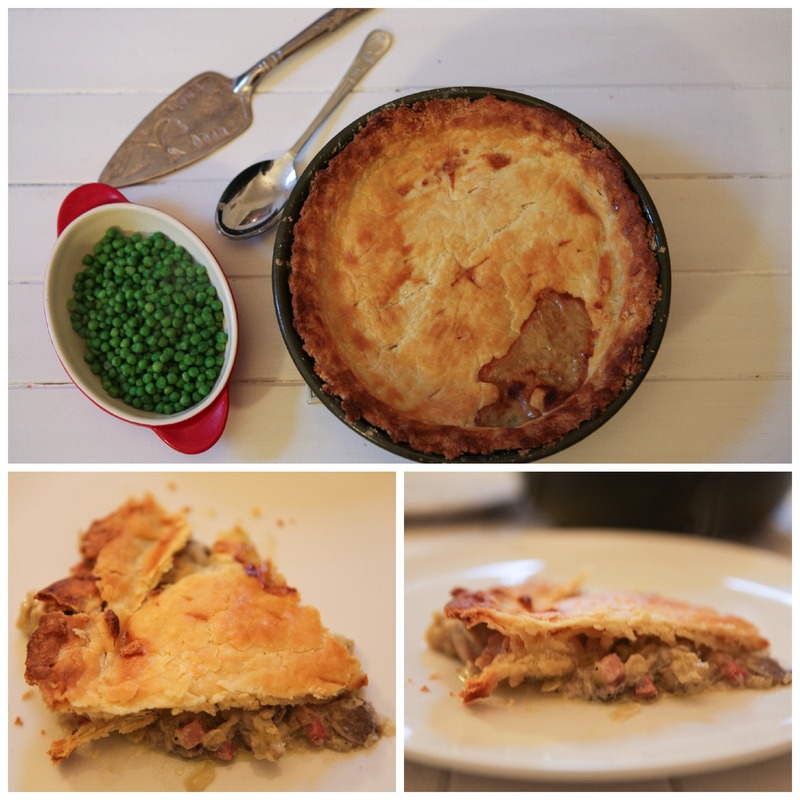 This pie freezes and reheats really well and it is a lovely thing to realise when you come home after a long day that there is a portion of this very comforting dinner in the freezer ready and waiting. Autumn is definitely making itself known over the last few days and as such I am trying to eek the last of Summer out of the food I am eating, whether that is big salads for lunch before I switch over to soup or dinners filled with bright, fresh colourful ingredients. Fresh corn on the cob sold still cocooned in its silky outer leaves hasn’t been available for very long in Ireland, we have had canned corn and frozen corn but fresh corn that you can scorch on the BBQ or slice straight in to salads is a relatively new thing. Tesco had lovely fresh corn on offer for €0.49 per ear last week and that became the basis for this really quick and tasty midweek supper. At home I had eggs, garlic, salad potatoes, a red pepper and half a ring of chorizo so I picked up the corn, spring onions, and some spinach and that is all that goes in to this dish. If you have never used fresh corn removing the kernels from the cob is really easy as long as you have a good knife. Removes the outer leaves and the strings and then stand the cob on its base and run the knife down each side from the tip to the base until you have removed all the kernels. The amount here served two with enough left over for my lunch the next day. 125 grams or half a ring of chorizo sausage, cubed. If you are celiac check the ingredients to make sure it is gluten free. Feta cheese or other cheese of your choice to sprinkle over. • Heat about a tablespoon of olive oile in a wide bottomed pan over a medium high heat and then add the pepper and chorizo. 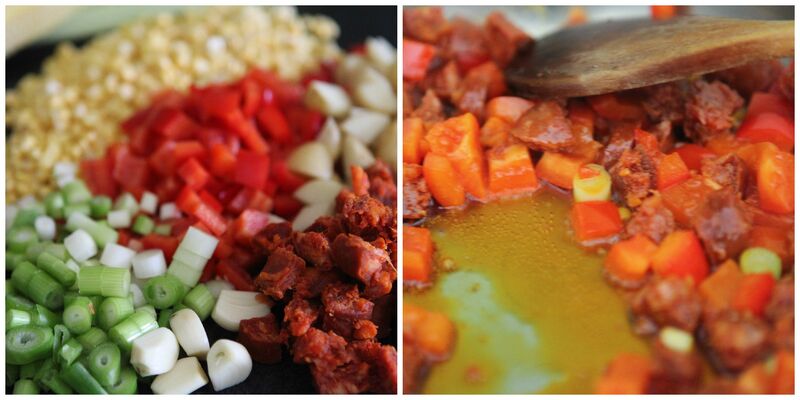 • Cook the pepper and chorizo until the chorizo starts to release the lovely paprika flavoured oil and then add the corn, spring onions, garlic and potatoes. • Stir until everything is coated in the oil and cooked through. • Add the spinach and cook until it just starts to wilt. • Season with salt and pepper and set aside over a low heat while you fry the eggs. • Heat some oil and a bit of butter if you fancy in a skillet or frying pan, when the butter starts to foam crack in your eggs and fry until the edges are crisp and lacy but the yolk is still soft. • Spoon some of the hash on to a plate and top with an egg, crumble over some feta cheese or grate some parmesan if you prefer. 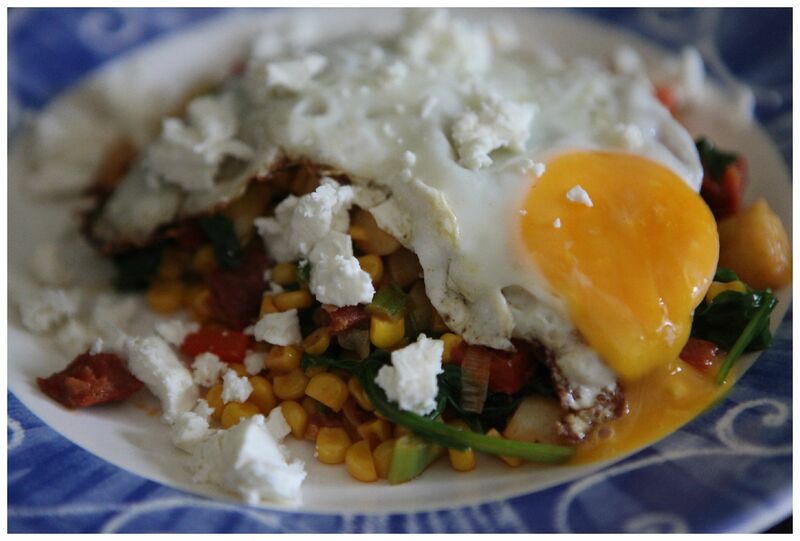 Slice in to the egg and let the egg yolk run down through the hash and mix with the oil then dig in and enjoy! You could serve this with some good bread but it is filling enough on its own. 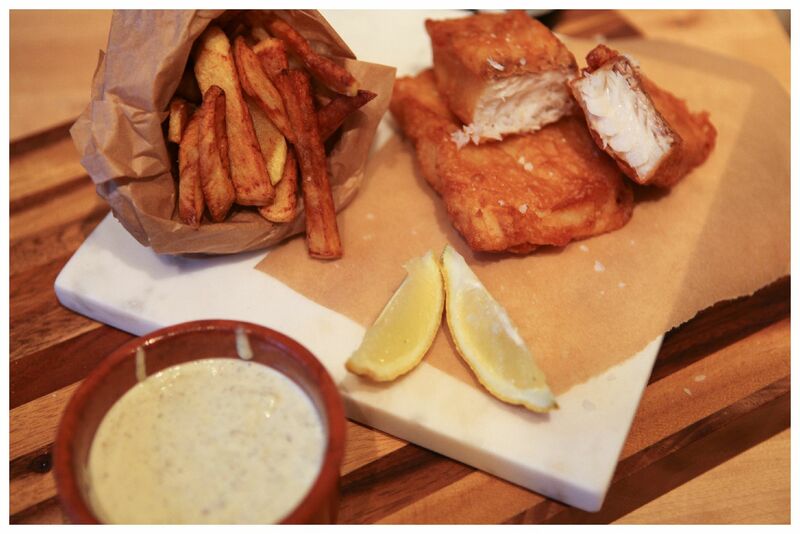 Last weekend I was down in Cork and my brother and his lovely lady told me that a very well known chip shop in Douglas, KC & Sons had started to list gluten free options on their menu. Being in that fragile state when one is not quite hungover but in need of salt and grease in order to keep body and soul together (post a weekend of wedding celebrations for my cousin) I was definitely interested in checking this out. Unfortunately when we reached that point in the queue when our orders were taken and I requested the gluten free option I heard the dreaded question, are you celiac? Now in O’Briens sandwich shop that is a reassuring question as it means the staff are going to be extra careful when making your sandwich however I knew by the grimace of this guy’s face that this was not the reason he was asking. On hearing that I am indeed celiac he then said that the food wasn’t suitable as it was cooked in the same oil as all the gluten containing foodstuffs. All I will say to KC & Sons is that they should not list things on their menu as gluten free when they are most definitely not. They should be clear that the product is made using gluten free ingredients and then extra clear about the fact that they are going to negate all that work by firing it in a fryer that is contaminated with gluten. I knew to be careful but a teenager or someone newly diagnosed could just have taken the statement of gluten free as fact and been made ill by eating unsuitable food. That is the issue here, gluten contaminated food will make people suffering with celiac disease very ill. Stop trying to appeal to a newly emerging demographic of people who choose to avoid gluten (I have no problem with those people at all, eat what makes you feel good) and be honest in your menus. The beer batter recipe is from Jamie Oliver adapted to be gluten free, the tartar sauce is Ina Garten and the chips are from Guy Fieri because I believe that guy knows a thing or two about chips. If you don’t have a deep fat fryer then you will need a sugar / oil thermometer for this but they are not expensive and you will get more use out of this piece of kitchen equipment than you might think. The best plan of action for this dinner is to peel and chip the potatoes and leave the chips to soak in water, next make the tartar sauce as this can be put in the fridge until needed. Make the batter for the fish and set aside. 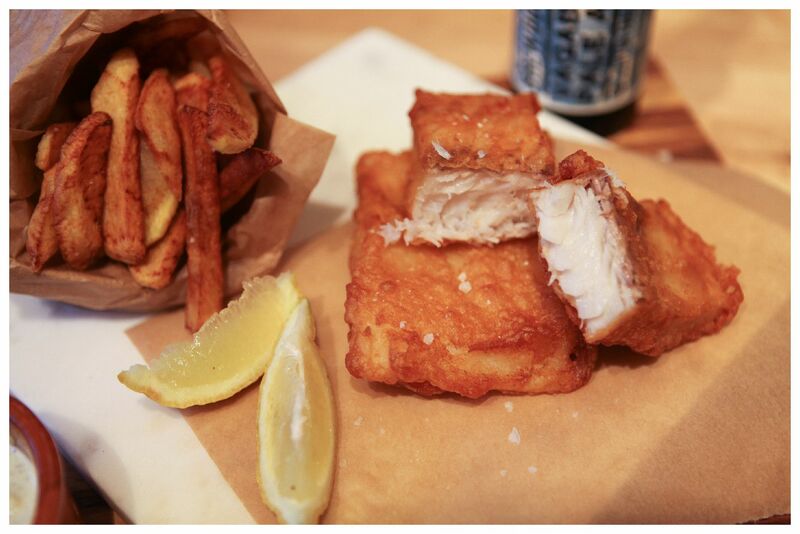 Give the twice cooked chips their first fry and then while they are cooling batter and fry the fish, while the fish is resting you can give the chips their second two minute fry. If you follow this plan everything will be still hot and crispy when you plate up. 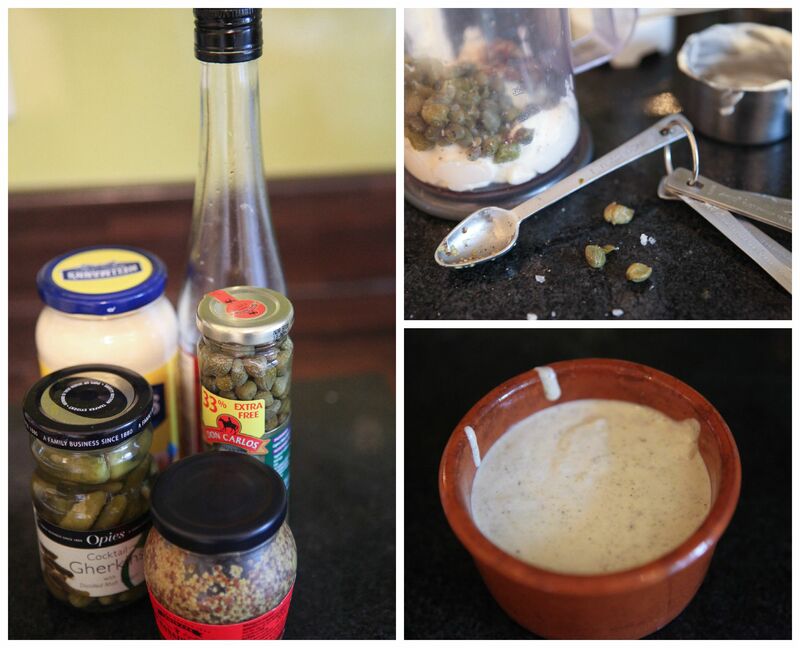 Simply put all of the ingredients ion to a blender or food processor, I used my immersion blender, and blend until the pickles and capers are finely chopped but not pureed. Spoon the sauce in to a bowl and place in the fridge until you need it. Peel the potatoes and cut in to thin chips. Soak the chips in cold water for an hour to remove some of the starch. When you are ready to fry, dry the chips on some kitchen paper. Heat about an inch and a half of the oil in a heavy bottomed deep sided pot until your thermometer reads 325 degrees and then carefully add in some of the chips, don’t over crowd the pan or you will just get soggy chips. Par cook until the chips are light brown this will take five to seven minutes. 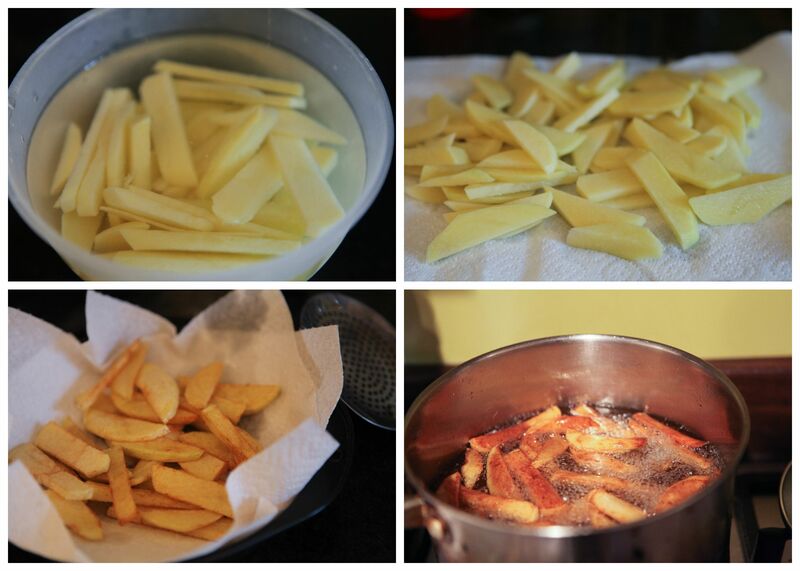 Remove the chips using a slotted spoon or basket and gently shake off excess oil. Allow the chips to rest on some kitchen paper. Repeat this process until all of the potatoes are par cooked. When you are ready to give the chips there second fry reheat the oil to 325 degrees and cook the potatoes, again a handful or so at a time so you don’t over crowd the pan. Fry until the chips are a deep golden brown, this should take about two minutes, again remove the chips from the oil and shake off the excess oil and drain on some kitchen paper. 2 fillets of white fish, I used Hake but Cod would be just as nice. 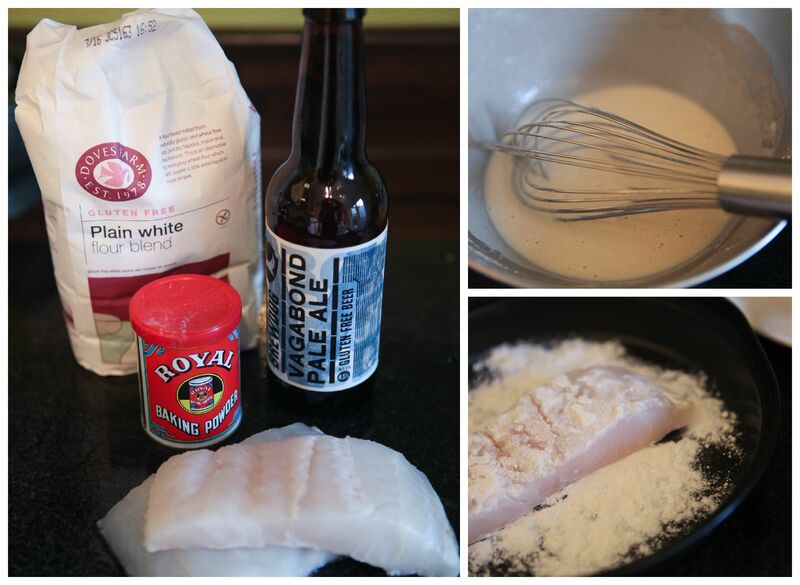 Make a batter by mixing the flour, baking powder and beer in a bowl with a hand whisk, you want the consistency of the batter to be like a thick double cream, thick enough that it will coat the fish. Dust the fillets on both sides with the flour and shake off the excess next holding one end in your fingers submerge the fillets in the batter until fully coated and carefully lower in to the very hot oil. Mind your fingers! 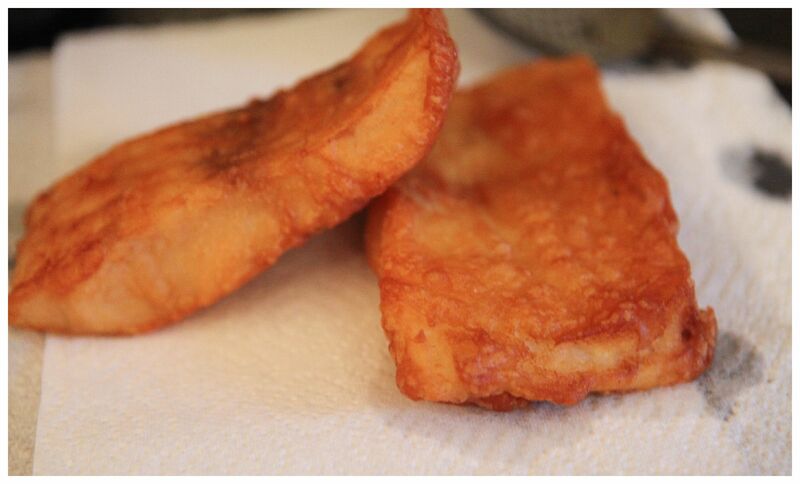 Cook for four to five minutes depending on the thickness of the fillets until the batter is golden brown and crispy. Serve with lemon wedges and tartar sauce or just plain ketchup and vinegar. In light of the fact that we are apparently expecting a bit of a heatwave I am re-posting this helpful article from last Summer on hosting a Gluten Free BBQ. Fingers crossed for good weather this weekend everyone! The Sun is out the weather is glorious (well it was yesterday!) and it is the season of the BBQ. Whether you have a serious BBQ set up in your back garden, a lovingly constructed brick number that doubles as a pizza oven or a disposable tray barbie there is nothing like firing up the gas or coals and enjoying some al fresco cooking. If you are celiac, or have some celiac friends you want to cater for, barbequing can present some challenges but they are easy enough to overcome. The main job of a host is to put their guests at ease and make them feel welcome. Many people with celiac get stressed out at the thought of the stress they are putting their prospective hosts under and will often volunteer to not eat or to bring their own food. This isn’t good for either party so communication is key, chat to your GF friend, ask for advice or suggestions and let them know that you take their condition seriously. The main thing to think about is your cooking surface, the grill tray. If you have previously cooked breaded food stuffs or anything in a bbq sauce or marinade that had gluten containing ingredients such as wheat, barley, oats and rye then you need to scald and scrub that tray. If it will fit put it in the dishwasher otherwise really get in there with a metal grill scourer. Another option, if you plan on cooking a limited selection of meat specifically for your GF buddy, would be to get a disposable BBQ that can be a dedicated GF area. Check the ingredients of your meat. If you are using fresh meat such as chops or steaks then buy them free of marinades or rubs and then either make your own or buy a Gluten Free version. Check the ingredients of burgers and sausages. For burgers you want a burger patty that is all meat with no breadcrumb filler. Ask the butcher or if you are buying pre-packed check the label. You could also buy some mince and make your own. There is a much larger selection of GF sausages about now than there used to be, Hodgins, Clonakilty and Jane Russell sausages are all available in a variety of super markets and Marks & Spencer’s do a nice selection of sausies using a gluten free crumb. GF bread can be a minefield, people tend to have preferences and you should where possible abide by them. For instance I like the Kelkin Sourdough bread, my nephew who is also celiac thinks it is wretched stuff. Ask your GF guest if they have a particular brand of bread they would like you to get, they may suggest they bring their own and that will solve the problem. Set up a little GF serving section, have separate cheese, tomatoes and pickles etc. For sauces you could either get squeezy bottles of condiments or decant tomato sauce, mayonnaise and mustard in to little serving bowls or jars so that your GF guest will know they are safe from cross contamination. If you are making salads you should again check ingredients, avoid croutons and dressings that have gluten. If you are making a variety of salads some with gluten containing ingredients then each bowl should have its own serving spoon to avoid cross contamination. Let your guests know the importance of keep the spoons in their assigned bowls, label them if you have to, to avoid cross contamination. Another handy thing to do would be to make little ingredients cards that you can put next to each salad so your GF guest knows what is and isn’t safe to eat without having to find you and ask you. For label inspiration look at pintrest, you can do many cute things with card and twine. It may seem a daunting task to prepare food for someone with celiac but with a little planning and research you should have no problem organising a bbq where everyone is happy and well fed. Your Gluten Free friends will really appreciate any effort you go to. This good weather is killing me, all I want to do is sit out in the sun sipping cocktails and waiting for the BBQ to heat up. I am rushing out of work in the evening trying to get home early enough to enjoy some patio time and although I haven’t yet found a BBQ that will fit our new tiny backyard I am trying to fill the craving with meals that can be cooked on the grill. 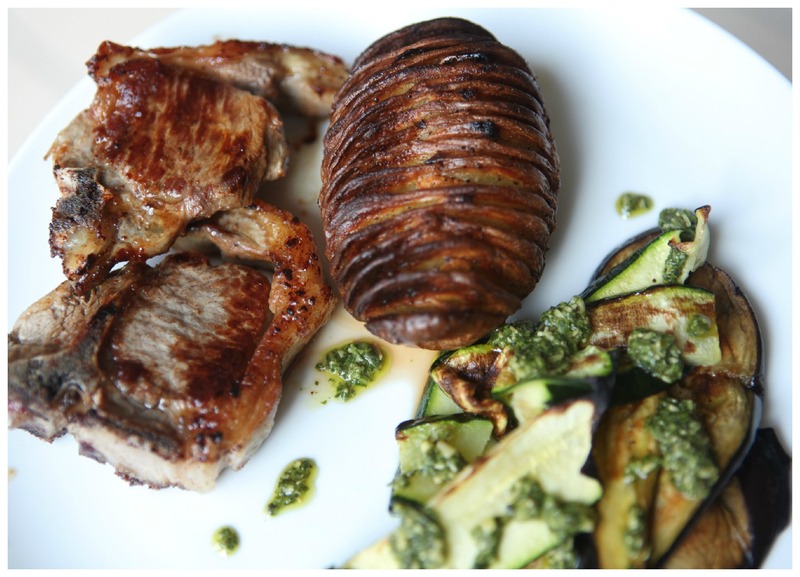 Sring lamb is now available so last night’s dinner was grilled lamb chops that had been marinated in rosemary and garlic, served with grilled sliced aubergine and courgette, drizzled with pesto and gloriously crisp hasselback potatoes. It wasn’t the most photogenic of meals but it was very tasty and I am very glad I finely got around to trying hasselback potatoes. I have had several recipes and images bookmarked for ages as they are so pretty, with their crisp golden edges. For some reason I kept thinking they would be complicated or time consuming or that I would end up slicing right thought he potato inadvertently ending up with a chopping board fully of chips. In reality they are simple as long as you give yourself a little bit of time, are patient and use a good knife! • To make the process of slicing in to the potatoes easier start by slicing a very thin layer off of the bottom of each potato to give you a flat base to rest it on. • Cut into the potatoes until you are about two thirds of the way through and then move the knife about 2mm along the top of the potato and make another cut, going down the same depth but at a slight angle so you are left with a thin slice of potato you can pull out. • When you have a potato that looks like an accordion take your thinly sliced garlic and wedge a slice in each space. If you feel like it you could add some thyme or other herb for flavour at this stage. 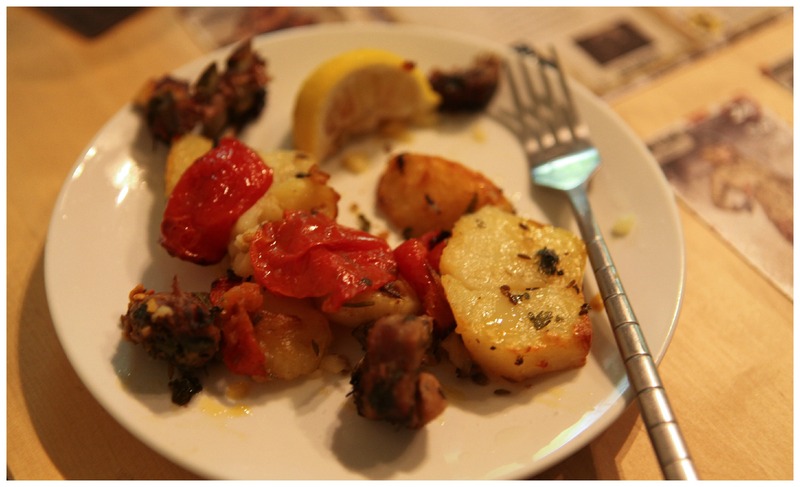 • Season generously with salt and pepper and then drizzle over a good glug of olive oil. • Place the tray in the preheated oven and bake for one hour or until golden and crisp on top and cooked through. Baste the potatoes with the melted butter and oil very fifteen minutes or so to keep the top edges crisp rather than burnt and dried out. These potatoes would be great with a Sunday roast or for a BBQ, baking away in the oven while you are tending the grill. They would be equally great as a light supper topped with melted cheese or served with salad. 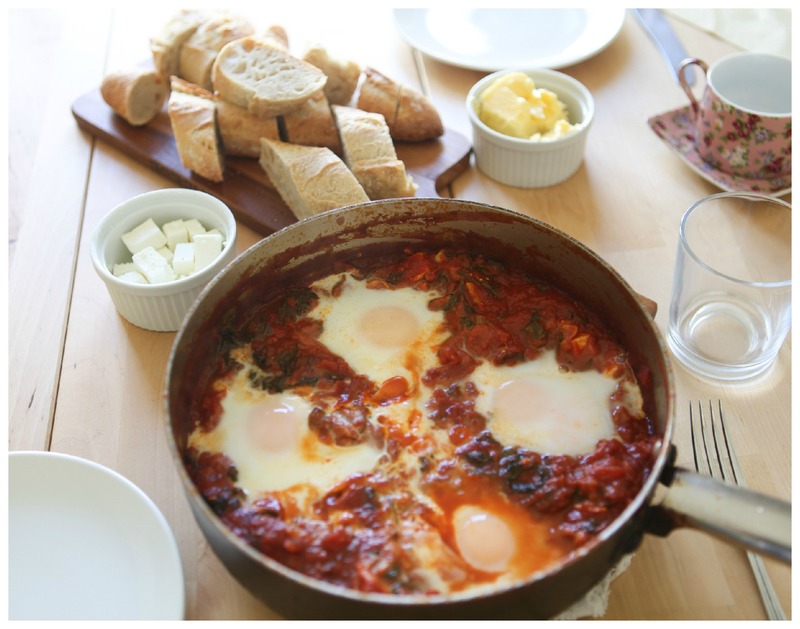 A casual brunch on a Sunday morning is one of my favourite ways to entertain, keep things simple and think of a meal you can serve from one pot with some nice bread, gluten free if necessary and a big jug of fresh orange juice with a bottle of prosecco and you will have a chilled out hostess and happy guests. Better still would be to find a recipe that can be prepped or cooked the night before that just needs a few minutes attention when your guests arrive and you will have a very pleasant afternoon. Shakshuka is something I have been meaning to try for a long time, I tend to make variations on this theme of eggs, pan cooked with fresh tomatoes, usually adding potatoes, peppers and chorizo, quite a bit but I felt that eggs served so simply in a simmering tomato sauce could be either a bit too acidic for breakfast or a bit too boring to serve for brunch. 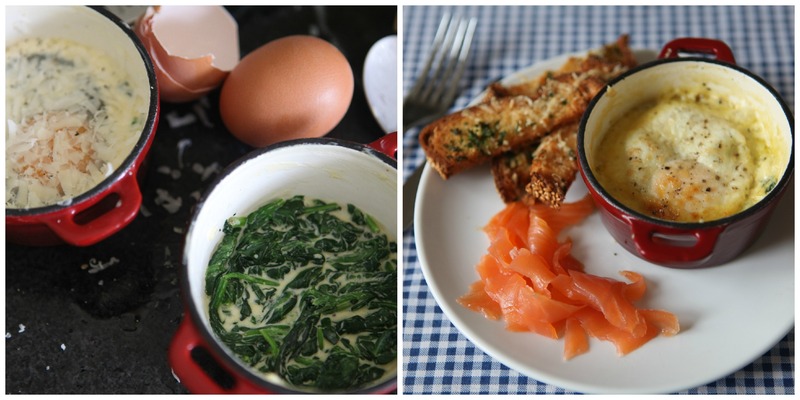 I can happily report I was wrong and I will be making this again and again, for brunch and also as a simple supper. I loosely followed the recipe from My Paris Kitchen, by David Lebovitz (I will eventually be able to put this cook book down and try recipes from other books I promise!) but I used shallots instead of onion, nixed the caraway seed and I reduced my sauce until it was almost a thick paste as that is how I prefer my tomato based sauces but you can reduce the cooking time if you want a more liquid sauce. • In a wide pan, heat the olive oil over medium heat. • Add in the shallots onions and garlic and cook gently for five to eight minutes until soft and translucent but not browned. • Stir in the chopped chilli, cumin, turmeric, smoked paprika salt and pepper. Cook for a minute. 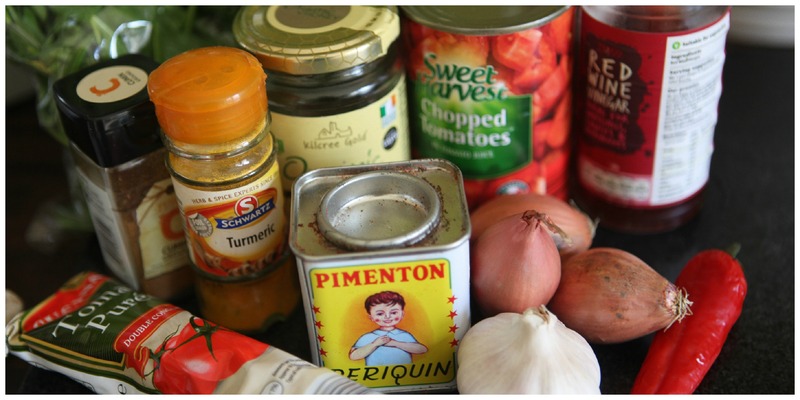 • Pour in the tinned tomatoes and then stir in the tomato puree, honey, and vinegar. • Keep the heat at medium and cook for 15 minutes until the sauce has thickened slightly. • If you are cooking this the night before you could turn off the heat now and cover the pan until the morning before reheating the sauce and following the next two steps. If you would like a thicker sauce allow the pan to sit over a low heat, stirring every now and then until the sauce has reduced to your preferred consistency. 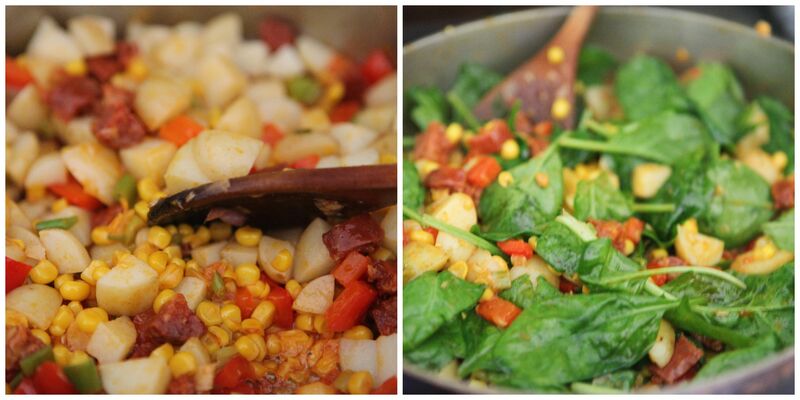 • Add your washed, drained spinach to the pan and allow it to wilt down before stirring it in to the sauce. • With the pan on a very low heat add the cubed feta to the sauce and use your spoon to gently bury the cheese in the tomato sauce. • Just before you are ready to serve make four indentations in the sauce and crack in the eggs, use a spatula or a fork to pull the egg whites in to the sauce, being careful not to break the yolks. • Keep the pan on a low simmer and cook until you are happy the eggs whites are set but the yolks are still deliciously runny, this could take up to ten minutes depending on the size of your eggs. If you have a liquid sauce you could baste the eggs with the tomato sauce. My sauce was too thick for this. 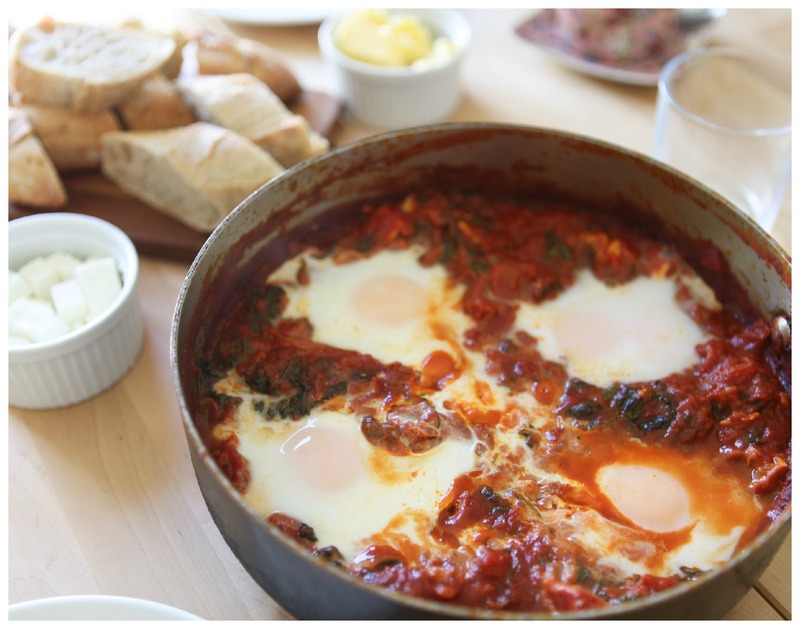 • Bring your pan to the table and serve the Shakshuka on preheated plates with plenty of bread, GF or otherwise, some crisp bacon if you can’t go without bacon at breakfast or some fried potatoes. Lazy weekends breakfasts are one of my favorite things, pottering around the kitchen before putting everything on a tray and heading back to bed if it is wintry or out in to the garden in the summer. Sipping coffee in comfortable silence while reading the papers or chatting about nothing and everything these breakfast are the antidote to all the weekday mornings spent rushing out the door first thing in the morning. Add some mimosas and friends and you have brunch and while I do love to go out for brunch sometimes it is nice to have people over and this baked egg dish is easy to adapt from two people to however many you want, all you need are the required number of eggs and ramikins. I served mine with smoked salmon on the side but you could serve smoked mackerel, sausage or some nicely crisped parma ham instead. As gluten free bread is often best toasted I decided to go a bit over the top and make some very rich toast soldiers to go with the baked eggs. These parmesan encrusted toasts only have one small clove of garlic in then which isn’t too much for a breakfast but if I was just cooking for me I would have upped the garlic! When baking the eggs it is important to keep checking them from the 6 minute mark if you want runny yolks as they could start to set very quickly depending on your oven. Four slices of gluten free bread. I used the Goodness Grain bread as it is delicious. place the soldiers on the baking sheet and grate over the parmesan, be as heavy handed as you like! grate over some parmesan, again use your best cheese judgement, you will know how much you like. Place the ramekins in the oven on the shelf below the baking toasts. If you put the eggs in about 6 minutes before the toasts are due to be done they should both be ready at the same time. Check the eggs after 6 minutes to see how close they are to being set, if you want a runny yolk shake the ramekin to see if the white is set band the yolk still wobbly. If you want a fully set egg leave the eggs in for at least 12 minutes. 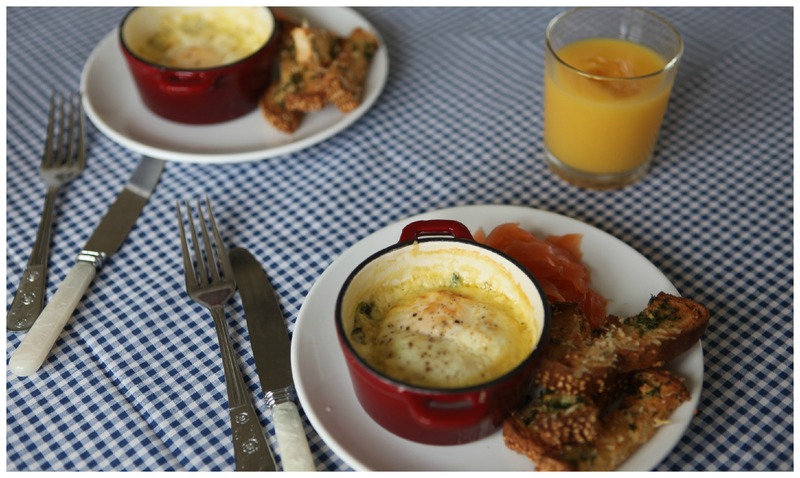 Place the ramekins on a plate and stack some of the toasts on the side, serve with smoked salmon or a side of your choosing. 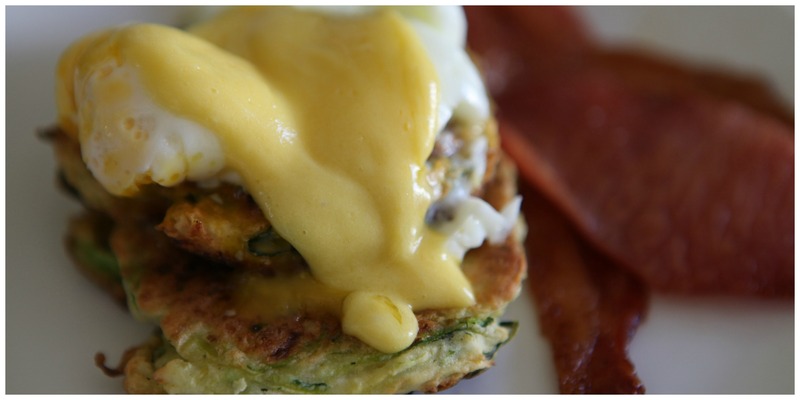 Stick a soldier in the runny yolk and enjoy! I had my first dinner party in my new house last weekend and I discovered I cannot fit seven adults and two children comfortably around my table, we squeezed in and it was fun and slightly chaotic but I am going to have to accept that my lovely wee house is exactly that, wee, and adjust my hosting activities accordingly. What I do love is my new kitchen, there is loads of counter space and an oven that is wider than 50 inches so I can fit a proper roasting tray in there. My old kitchen had two sockets, this one has an embarrassment of electrical outlets so I can plug in all my appliances and still have somewhere to plug in my stereo and having music in the kitchen while I cook is something I have missed for a very long time. As I knew things would be quite tight I planned a meal that could be eaten buffet style if fitting around the dining table proved completely impossible. Leafing through some cookbooks I stopped at the Eight Hour Lamb from What Katie Ate, an absolutely beautiful book from an Irish woman living the dream in Australia. As people were coming for an early dinner and I knew I wasn’t going to get up oat the crack of dawn on a Bank Holiday Sunday to put lamb in the oven I used a separate recipe to cook the lamb but kept the dressing and feta from the original recipe. The result was a gorgeous shredded lamb, drizzled with a dressing so good I would it eat with a spoon from the jar all topped with some crumbled feta. Stick some lemon wedges in there and this was a meal that looked as good as it tasted. • Use a sharp knife to make slits in the fat on the leg of lamb and push in a slice of garlic and some of the chopped down sprigs of rosemary. • Reduce the oven temperature to 180/ Gas 4/ 325f andd the lemon wedges to the tin and cover the roasting tin with tinfoil. • Cook the covered lamb for two and a half hours. Remove from the ooven and allow to rest, still covered for twenty minutes. I served the lamb with a warm potato and olive salad and some green leaves and it was delicious. Put the rest of the dressing on the table so people can spoon on more as they wish. Being celiac I miss the ease or ordering take out, things are better now but I am still limited in what I can order and where I can order from. There are certain things I really miss that I have resigned myself to never being able to order again and one of them is a crisply deep fried spring roll, preferable dunked in the luminous orange sweet and sour sauce that is the dipping sauce of choice for many Chinese take away customers in Ireland. I have tried quite a few recipes from the absolutely gorgeous Alastair Hendy book Asia and some of them have become firm favourites already but I have shied away for the recipe for rice paper spring rolls as I have tried to make spring rolls with rice paper in the past, as has my sister who is a much better cook than me and the results haven’t been great. The rice paper rolls tended to split or just explode so you are left with a pan full of deep fried filling. But his looked so pretty (mine are not so pretty, be warned) and I had a hankering for something deep fried and tasty last weekend so I decided to try again. I love cooking from this book as the ingredients are always so colourful, aromatic and flavourful, that the cooking itself is a pleasure. This is a very simple recipe but constructing the rolls will take a bit of time so when you have everything prepped to go I would advise you to put on some music and take your time putting the rolls together. Blanch the beansprouts in hot water for a minute, then drain. Set up a rolling station with a bowl of warm water, your filling a plate to roll on and a plate for the finished rolls. Use a big plate to hold the rolls as they will stick to each other, allow them a bit of space. 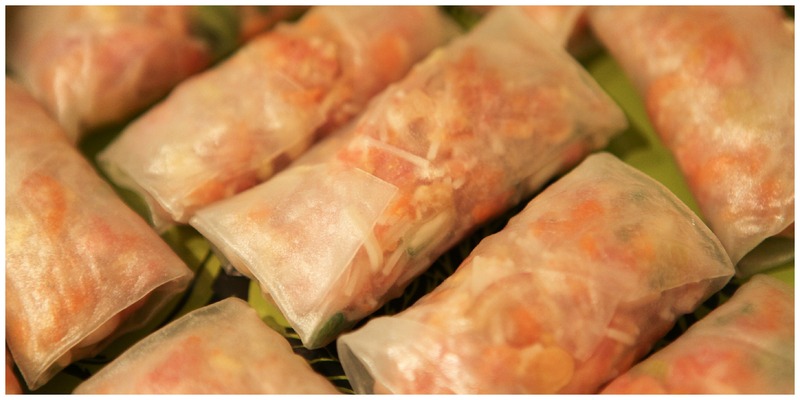 Briefly dip the rice paper sheet in the warm water and place on your rolling plate. When the sheet has softened fold down one side, about a an inch towards the centre of the sheet. Place about two teaspoons of the filling on top of this folded section and then bring in each side of the sheet, do not pull the sides in two tightly or the roll may spilt when frying. Roll from the top, where the filling is towards the bottom of the sheet, again don’t make the roll too tight. Place the finished roll, seam side down on yourplate and start on the next roll. Heat 4cm of oil in a deep pan, if you have a deep fryer you can use this. Use at least 4 cm of oil otherwise the rolls will stick to the bottom of the pan. There was no temperature guide given in the cook book but some googling suggested a temp of 365F on a sugar / oil thermometer. Place the rolls in the pan, do not overcrowd the pan. I cooked four to five at a time. Allow the rolls to fry for at least three minutes before attempting to turn then, other wise they may stick or split, I found the best way of turning them was to nudge them gently with some chop sticks and then they just bounced over to the uncooked side. Cook for a further three minutes and then take one out and cut it open to see if the filling has cooked through. My rolls took an average of 6 minutes to cook through. Drain the rolls on some kitchen paper and continue with the next batch. Serve the rolls with your dipping sauce of choice and some herbs, coriander would be good, wrapped in some crisp green salad leaves. The rolls will not look exactly like spring rolls as you know them and mine were not the prettiest but they were crisp, very tasty and were definitely exactly what I was craving last weekend! Apologies for the disruption in our scheduling here over the last two weeks but life life did its best to get in the way of blogging however finally we are moved! The moving is done, the boxing and sorting through things, mercilessly throwing out everything if you are me or hoarding old birthday cards and kids drawings if you are Dave. 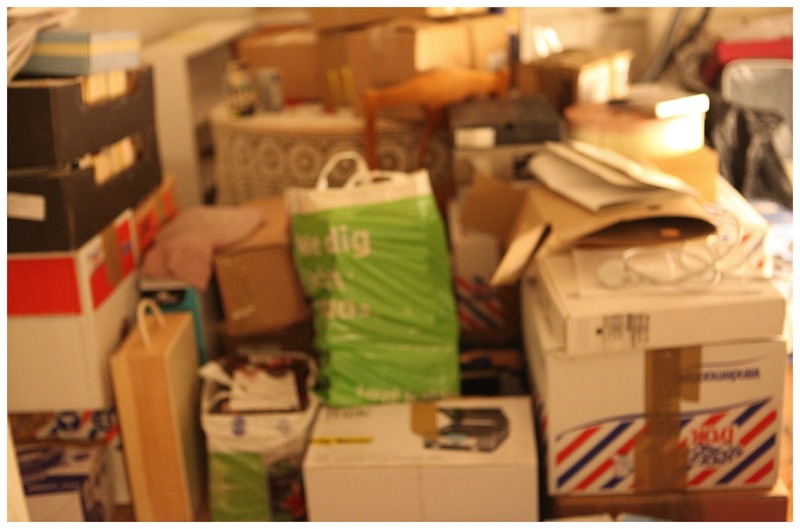 It was a uncomfortable experience for me because I cannot relax in an untidy house and every evening spent looking at towers of boxes and bags over flowing with books was an evening that worked on frazzling my last nerve. We accidently / luckily packed all the cd’s except the Best of Queen, never a bad thing but I had Flash on repeat so many times, reliving the amazingness that is the final skate from Blades of Glory that Dave would have been justified in throwing many newspaper wrapped items at my head. We trundled along getting things done and then on Friday night, our last night in the old house, while I was standing in the queue in Centra clutching the bottle of wine that was going to get me through the evening Dave pointed at the silent TV where news of Leonard Nimoy’s death was scrolling across the screen. I was gutted, I love sci- fi and that love began with the original series of Star Trek and that love began with Spock. Leonard Nimoy always seemed like a genuinely good guy, a writer, actor, director and photographer and I am sad that he is gone, he was a great example of how to live well in this world. We spent our last night on our old couch watching Star Trek IV, The Undiscovered Country, I couldn’t have coped with Wrath of Kahn, while I sobbed in to my rice noodles and much needed glass of wine. The night before I had made my second comforting dish as recommended by the internet, Mac and Cheese but I don’t think even this dish, deeply comforting though it is would have made me feel any better on Friday evening. 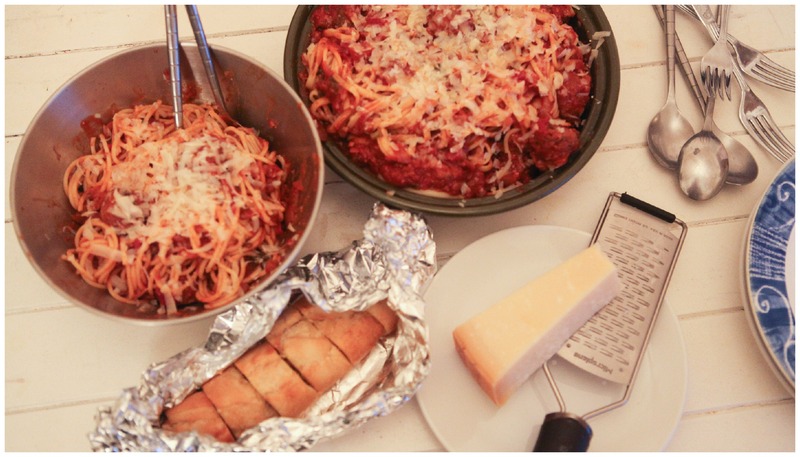 This recipe, adapted from a Smitten Kitchen recipe, adapted in turn from an Ina Garten recipe was really good, dangerously good, I had to move the dish that held enough pasta for 4 – 6 people off the table so that the two of us wouldn’t finish the whole thing. Much like the frightening amount of sugar in the brownies this dish calls for an unnerving quantity of cheese. Be brave, try not to think of your arteries and remember rather than serving this on its own you could serve it in small portions as a side or with a big healthy green salad. 8 to 9 ounces of Gluten Free macaroni ( half a one pound bag) I used the Heinz GF Macaroni I found in Tesco and it worked really well. 3 – 4 slices of Gluten Free white bread, crumbed. Salt to taste and for the pasta water. • Butter a casserole or other oven proof dish, I used a 9” x 9” square dish. • Heat the milk in a sauce pan over a low heat. • Melt the butter in a high sided pan or sauce pan and when it starts to bubble add the ¼ cup of flour. • Mix the flour and butter together and cook for one minute over a medium heat. • Get a whisk and start ladling the hot milk in to the flour mix, whisking continuously. • Add the milk a ladle at a time and keep whisking, be patient with this, it can sometimes be difficult to get a truly smooth GF béchamel sauce. • When all the milk is added continue to cook, still whisking until the mix thickens. • Remove the pan from the heat and stir in the black pepper, cayenne, nutmeg and 2 thirds of the grated cheese. I stirred my cheeses together in a bowl so they would be nicely mixed. Keep the remaining cheese for the crumb topping. • Stir the sauce until everything is nicely combined and then add salt to taste. Set the sauce aside. • Bring a big pot of salted water to boil and add your macaroni. Cook for 2 – 3 minutes until al dente, the pasta will continue to cook in the sauce. Drain the pasta and rinse under cold running water. 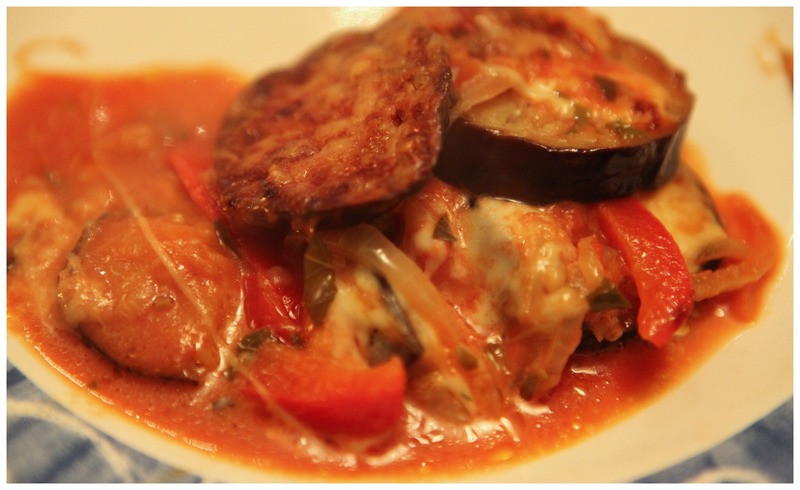 • Stir the pasta in to the sauce and pour in to the casserole dish. 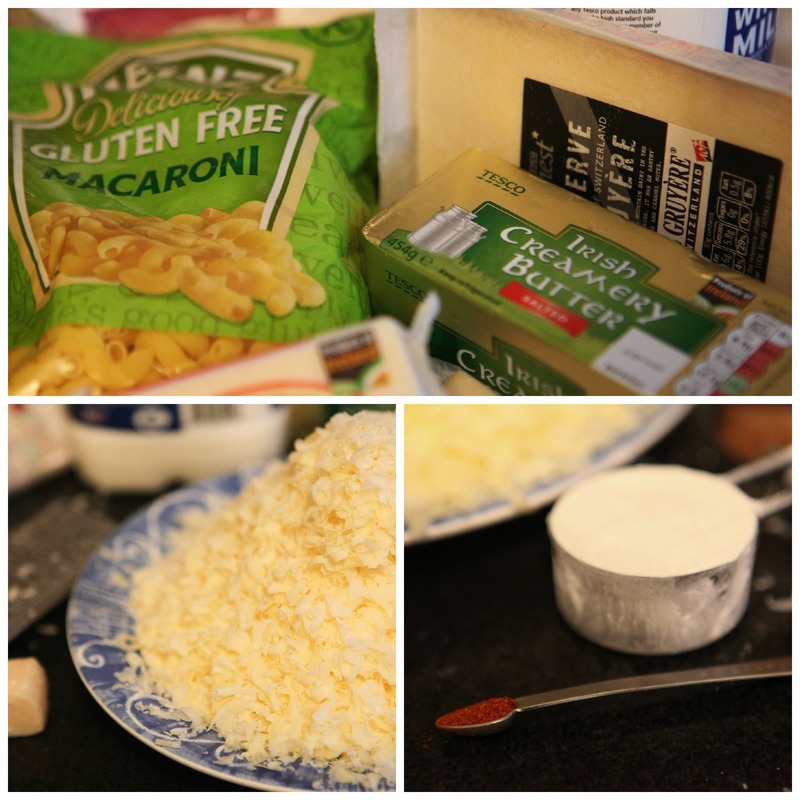 • Combine the GF breadcrumbs with the remaining cheese and layer this thickly over the pasta. • Put the dish in the oven and bake for 30 to 35 minutes or until the topping is golden brown. Allow the mac and cheese to sit for a minute before serving but enjoy it while it is still meltingly, cheesy and delicious. This is food that makes your soul and your stomach feel better and is as the internet advised, very comforting! A lot of people still think of eating Gluten Free as being a fad diet rather than a medical necessity . These are people who just haven’t taken the time to do any research or actually speak with a person with celiac in order to understand the condition. I don’t pay much attention to these people as they usually have loud and uniformed opinions on everything from lifestyle choices and popular culture to politics and religion. I see them attacking pretty much all dietary choices that are different to theirs. To them if you look at food as something that can help or hurt your body then you are a crank or a whinger, being difficult for no good reason. I eat how I eat for my health and there are other people out there who have specific diets that suit their health. I am so grateful that I am not lactose intolerant, I can’t imagine a life with no cheese, but just because I can eat cheese doesn’t mean I judge those that can’t. There are diets like the Specific Carbohydrate Diet that help people with Crohns disease and I know people who have been put on anti -inflammatory diets for arthritis. My point here is that you never know why someone eats the way they do and therefore it is best to withhold judgement and scathing comment. Be polite is what I am saying. Hold your whisht, is what my Granny would have said. I recently had a guest who is following a Paleo Diet, I know it is the buzz word of the moment but the important thing is that eating this way makes them feel better. They did not try to indoctrinate me in the ways of Paleo or sneer at what I ate and in fact I have never met anyone who has tried to force a diet on to me. As I like to accommodate any guest in my home be they vegetarian, lactose intolerant or vegan, I wanted to serve up a meal that this person could happily eat knowing they were sticking to the guidelines they choose to eat by. So many friends and family have gone out of their way over the years to accommodate me that this is the least I can do. I know a bit about Pale as there is an overlap on a lot of websites between Gluten Free and Paleo cooking. 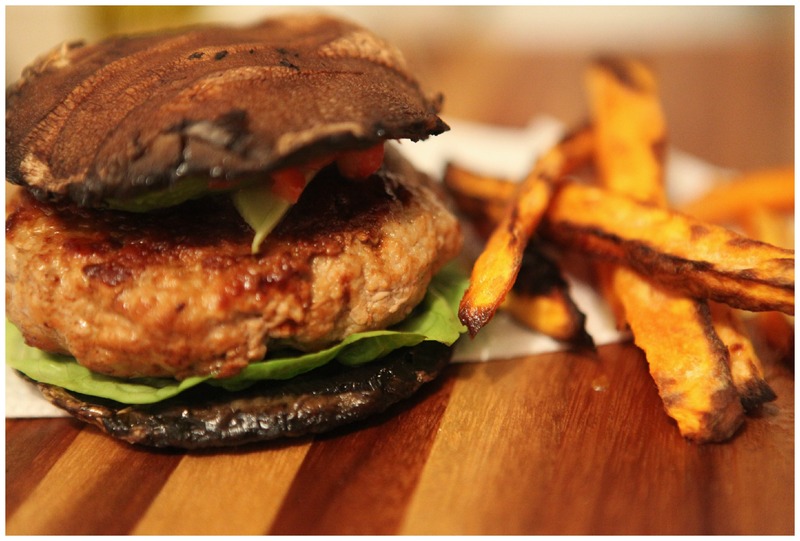 As I had already planned to make burgers for dinner I had a quick search of the internet for bread bun alternatives and found a couple of suggestions for using Portobello mushrooms as a burger bun. I always make homemade burgers to avoid any filler’s that may contain gluten. I usually use turkey, lamb or pork mince, adding whatever flavours I feel like at the time, garlic powder, onion salt, fresh thyme, Cajun spice mix or Bay West seasoning. 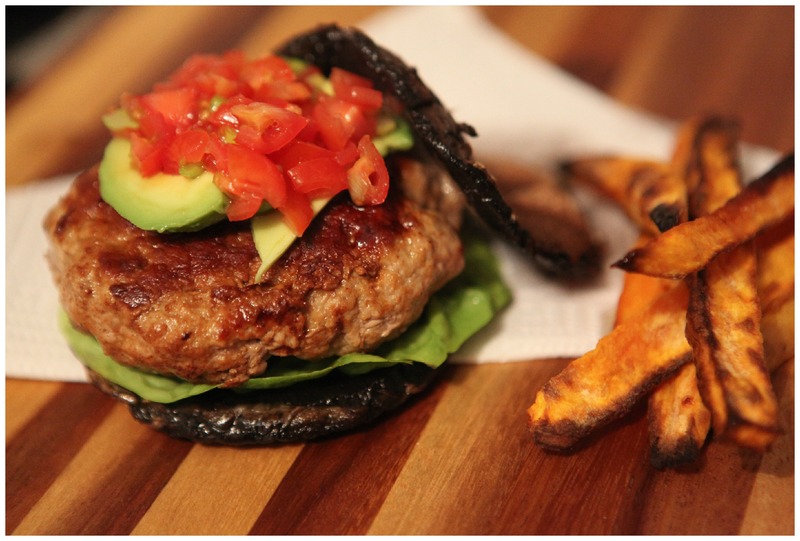 These burgers were made with a Chipotle Rub (gluten and wheat free) that I picked up in the Mexican section of Fallon & Byrne, it is gorgeous in chilli, on chicken for Fajitas or sprinkled on pork chops. 2 teaspoons of Chipotle Rub, or seasoning of your choice. Place a heavy pan over a medium heat and add a tablespoon of olive oil. 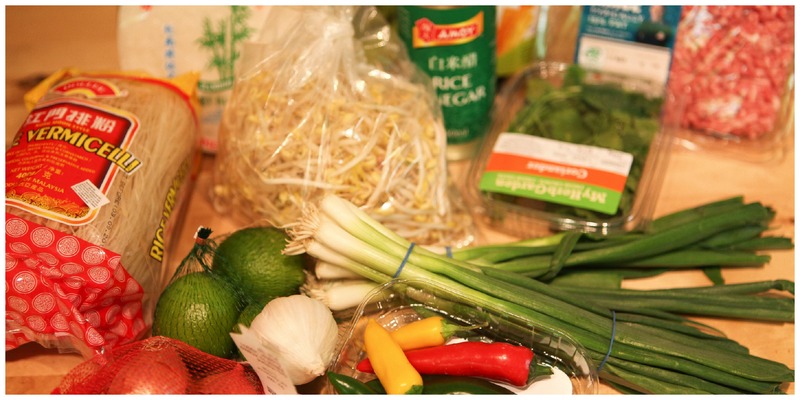 In a bowl mix together the mince, seasoning and slat & Pepper, use your hands and make sure everything is fully combined. Divide the mince in to three equal sized balls and then form in to flat patties using your hands. Place the burger patties in the pan and allow to brown on one side before flipping them over, continue to cook, reducing the heat to medium low for twenty minutes or until cooked through. Take the mushrooms and with a knife remove the stem at the base and then using a desert spoon scoop out the dark gills, this forms a shell that your burger will sit in. Drizzle the mushrooms on both sides with a little olive oil and then place cut side down on a tray. Place in the oven and cook for ten minutes, if you feel they need more time then flip them over and cook for a further 5 minutes. Place on of the Mushrooms on a plate and top with some lettuce, add the cooked burger patty and top with the condiments of your choice. I added sliced avocado and some tomato salsa to go with the Mexican flavour of the burger. Top with the second mushroom and serve with some oven cooked sweet potato fries or a side salad. You will also need plenty of napkins, mushroom juice will run down your hands but it is good messy eating, comparable to Chicken wings or BBQ ribs! I have mentioned before that I love cookbooks that inspire my partner to cook for me. Speaking of which I really wish there was a word for long term significant other who shares home and bills and joys and sorrows that was better than partner. You get to an age when boyfriend / girlfriend sounds ridiculous, lover implies endless romance and secret trysts in fancy hotels and partner is way to formal. I truly believe there are people out there who would have happily cohabitated forever without ever putting a ring on it just so they could use they could avoid the whole what should I call my partner debate and just use husband / wife. Now that little rant is out of the way the point is I like when Dave cooks for me. I recently came home after working late to a glass of wine and a roast chicken dinner in the middle of the week and it was truly a joyous experience. 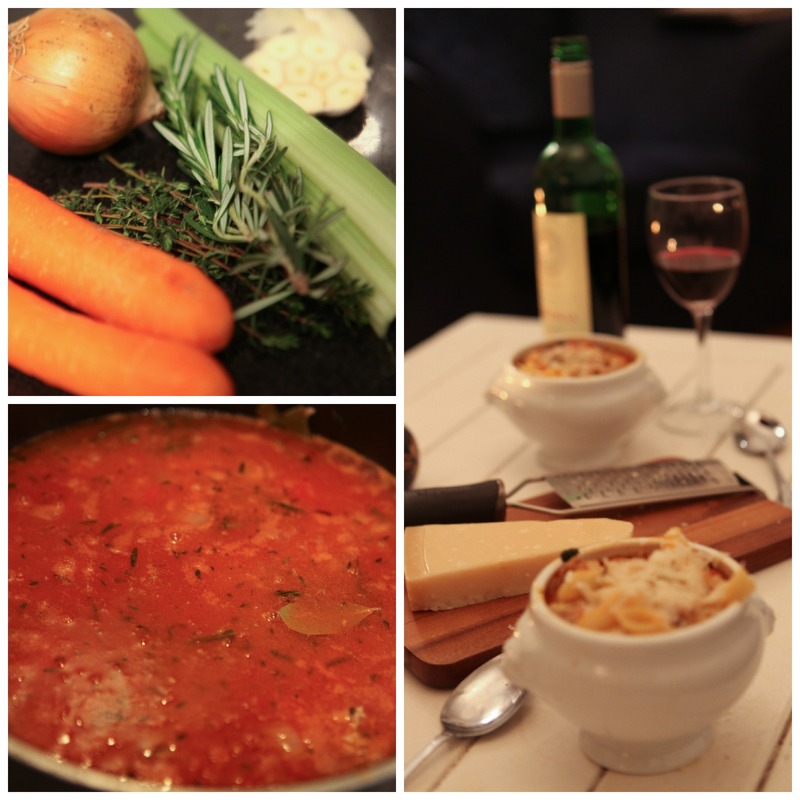 Dave’s forte is soup, he likes to make soup and has some excellent recipes in his repertoire. 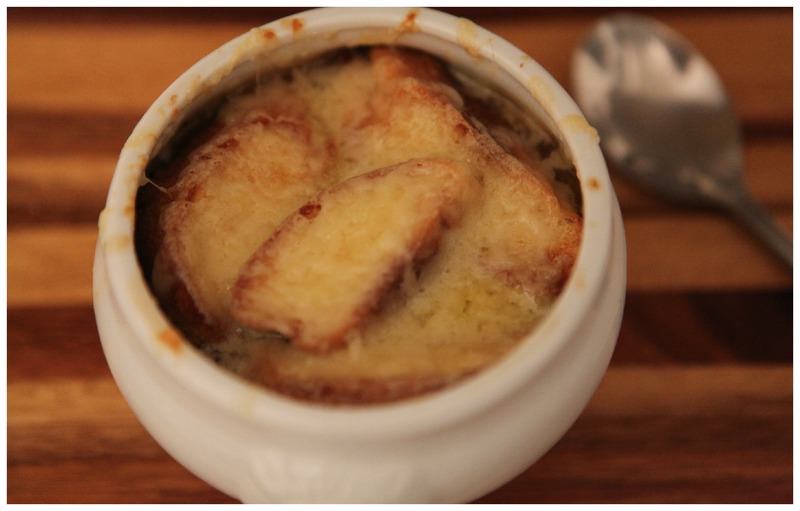 One of his best is French Onion Soup laden with golden bubbling gruyere. His go to recipe for this has always been Anthony Bourdain’s from the Les Halles cookbook but he decided to try David Lebovitz’s version from the gorgeous book My Paris Life. I loved this version where the natural sweetness of the onions is the star. When I have French Onion Soup I sometimes forgo the croutons and just put a wodge of grated gruyere in my soup bowl before ladling over the soup. This way you get the hidden treasure of melted cheese with every spoon of soup. This time however I took on the Purebred soft white rolls, http://www.pure-bred.com/products/supersoft-white-sandwich-rolls, sliced it on the diagonal and toasted it under the grill to make Gluten Free croutons. Add the garlic , salt and pepper . Reduce the heat and cook, uncovered, for one and a half hours, stir every now and then and scrape up any bits on onion that may brown and stick to the bottom of the pot. Keep an eye on the heat as you don’t want the onions to burn, this is a long slow cooking process that draws out all the sugar from the onions. When the onions have disintegrated in to a thick golden brown paste stir in the GF flour and cook for one minute. Pour over the wine and stir thoroughly to scrape up any bits that are caramelised and stuck to the pot, this is where all the flavour is. Add the stock and bring to the boil. Reduce the heat and simmer uncovered for forty five minutes. Add in the balsamic vinegar and taste for seasoning adding salt and pepper if you need to. To serve ladle the soup in to heat proof bowls and place the toasted croutons on top of the soup, cover with a good handful of grated gruyere. You can either melt the cheese by placing the soup bowls in the oven or under a hot grill. Enjoy! This is my third pizza review for this blog, this may lead you to think that I like pizza and you would be correct. I like pizza, the bubbling tomato sauce, the melting mozzarella stringing out as you pull the slice away from the pie. I am a fan of all kinds of toppings except chicken, it just seems wrong, and I even love the crusts. In my less responsible days the best slice of pizza was the one you found still in the take away box, like a little gift from the hangover gods, the morning after that night when you definitely didn’t recognise the drink that was one too many. Going gluten free has curtailed my access to good pizza. GF pizza is pretty easily available now days however the quest continues for really good GF pizza in Ireland. The best GF pizza I had recently was in Malmo, Sweden. The base was thin and crisp, perfectly blackened and blistered having been cooked in a proper wood fired pizza oven. The tomato sauce was beautiful, and the toppings of translucent shreds of Parma ham, olives and basil reminded me that Gluten Free does not have to equal disappointment. Today’s pizza is from Padraigin’s, http://padraiginspizza.com/. I have had bad experiences in the past with Padraigin’s GF pizza’s. The only one available seemed to be trying to make up for being GF by overloading the base with toppings, unfortunately this usually meant that the overwhelmed base crumbled during the cooking. However since it had been a few years I decided to give them another go. This version is a ham pizza and cost €5.49 in my local supermarket. It has clear cooking instructions and in true Padraigin’s spirit it didn’t skimp on the topping. The pizza cooked well but I did notice that the base isn’t too much different from the Tesco frozen GF pizza, it has the same bready consistence. The sauce was fine and there was a plenty of cheese, however the amount of ham on the pizza a bit much after the first few bites. Personally I think ham on a pizza always needs something else, olives, mushrooms, even some basil or pineapple would have really helped here. All in all it was fine and did fill the spot on a cold and miserable January Sunday when the thought of having to go the work the next day was killing my desire to cook. 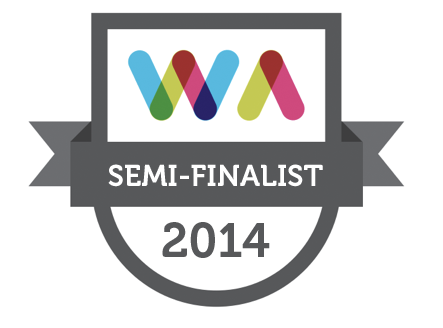 The search continues though….. Welcome to our first post of 2015! I hope all of you had an amazing Christmas season and are settling back in to in the post festive world. Now that we have survived that wretched first week back to work it is time to really settle in to this New Year. My Christmas, back home in Cork, revolved as always around food so it is proving to be an adjustment to my system to try and get back in to a normal eating routine. I am sad that everyday can’t start with prossecco and smoked salmon, that lunch can’t always be a choice between the amazing soup my sister magiced up from the carcass of our roast goose or some glorious pate or that every meal isn’t accompanied by great wine and followed by cheese or trifle or pudding with a late evening gin and tonic to aid digestion. Now that I am staring in to the long three weeks that remain until payday I am looking for recipes that won’t break the bank but are also tasty enough to not be a shock to my overly indulged system. I don’t really understand the logic of jumping straight into a diet in the New Year, I prefer to gradually wean myself away from luxury food by purging all the festive goodies that are left in my fridge and stretching them out to make as many dinners as I can. 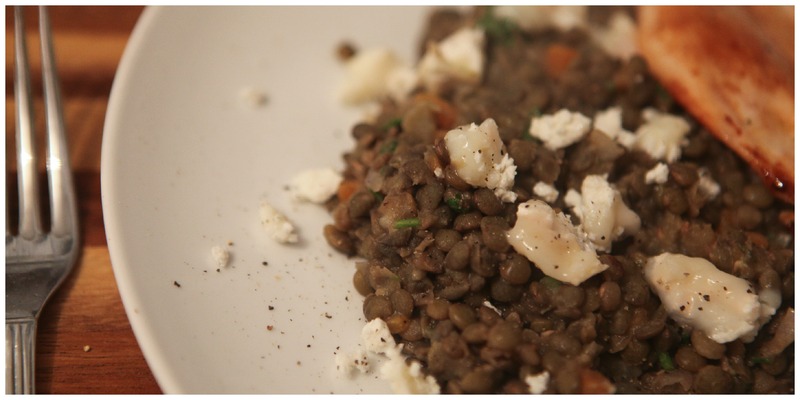 Thus a lovely camembert that was part of gift hamper was turned in to a camembert and leek tart and some goats cheese found a home in this lentil salad. This warm lentil salad is from My Paris Kitchen by David Lebovitz , this book was the first thing on my christmas list this year as I have been reading David Lebovitz’s blog for quite a while. While I do love the immediacy of checking out food writing on the internet there is still nothing like sitting down with some truly great food writing accompanied by beautiful recipes and I spent a good few pajama days curled on the couch with this book over the last few weeks. This is a very simple recipe that will be kind to frugal cooks and the salad is an good accompaniment to pretty much any meat, I paired it with some chicken breasts I baked in the oven with butter and lemon juice and it made a delicious simple meal that still felt indulgent with the goats cheese melting through and coating the lentils. This is also one of those dishes that is naturally gluten free so it didn’t take any adjusting or tweaking. This makes a good sized bowl of lentil salad and will keep in the fridge for 2 days so if you aren’t going to use the whole salad at dinner then add the goats cheese to the portion of salad you are using and set aside the remaining cheese to use with the left overs. The original recipe called for both walnuts and walnut oil but as I was trying to make do with what I had I didn’t use either, however I have used walnut oil in the past and I would recommend using it here if you can, I know that I am really looking forward to trying this post pay day when I can afford walnut oil! 1 & 1/4 teaspoons of sea salt or maldon salt. If you are using table salt then add it to taste. 1/3 cup of olive oil or half walnut oil half olive oil. 130 grams of soft goats cheese to crumble over the top. 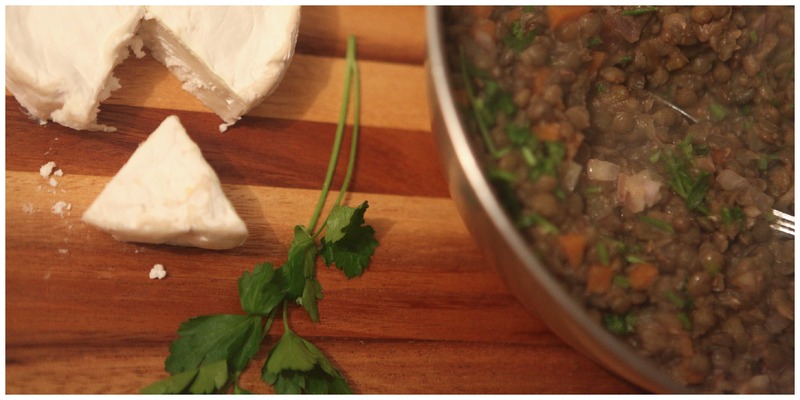 Rinse the lentils and put them, with the herbs in a pot with plenty of salted water. Bring the pot to the boil and then cover and reduce the heat to a simmer. Allow the lentils to cook for 15 minutes. Add the diced vegetables and return the lid to the pot. Cook for an additional five to ten minutes until the lentils are cooked but not too soft., drain the lentils and remove the herbs. Make the dressing by combing the oil, vinegar, mustard, salt and diced shallot in a jar, seal the lid on the jar and give it a good shake, this will give you a well mixed dressing. Test for seasoning. Put the lentils in a bowl and add the dressing while the lentils are still warm. 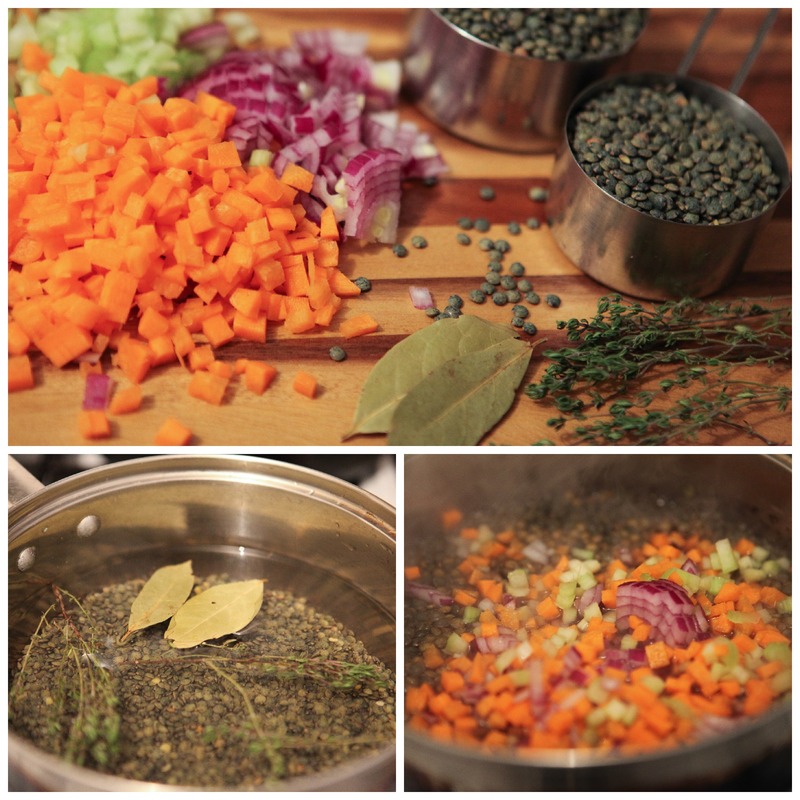 Allow to cool a little, the lentils are best served warm or at room temperature. If you are adding all the cheese crumble it in to the lentils when they have cooled so that the cheese doesn’t melt and disappear. Stir through the chopped parsley and grind on some fresh black pepper. Not only was this a great dinner it has also provided me with at least two mid week lunches, you just need to reheat the lentils and add the remaining goats cheese. So we are trundling along with festive recipes starting with Gluten Free Pudding last week, soon I will post a recipe for my favourite mince pies but first I want to try and tempt you to make your own mincemeat, I have jars of GF mincemeat in a health food shops but I have to say there is mothing like homemade mincemeat, once you try it you may find that you never go back to the shop bought variety. 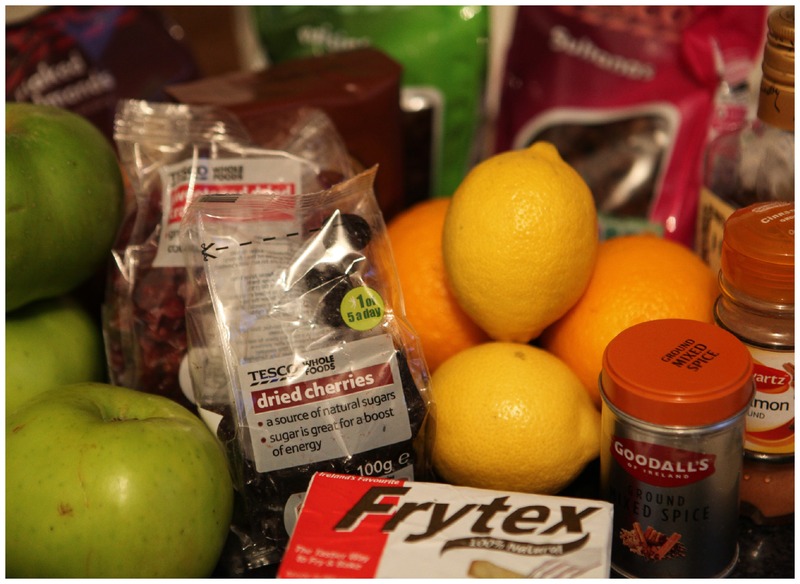 Making your own mincemeat gives you so much control over what goes in to your pies. If you don’t like currants ( fruit of the devil in my eyes) than you don’t need to add currents, you can substitute another dried fruit instead, if you hate candied peel again you can use something else, in the past I have used dried papaya, pineapple and mango instead of mixed peel and the results were delicious. I use flaked almonds in my mincemeat, my Mum thinks these resemble nail clippings so she uses chopped almonds. As long as the quantities work you can feel free to experiment. What makes this Gluten Free is that I use lard rather than suet as suet is often dusted with flour to stop it sticking, if you want a vegetarian version of this you could use butter. Prep your jars by washing thoroughly and leaving to dry in a low temperature oven, Gas 1 or the equivalent. Store the mincemeat in a cool dry place. 450 grams cooking apples, peeled, cored and grated. 1. Place the dried fruit, sugar, spices and almonds in a bowl and stir with a fork to combine. 2. Add the grated apple, grated lard, the zest and juice of the lemons and orange and stir through the fruit until thoroughly mixed. 3. Cover the bowl and leave to sit in a cool, dry place for 12 hours or overnight. 4. Heat your oven to Gas ½, 120c / 225, and place the mincemeat in an oven proof dish. Cover loosely with foil and place in the oven for 3 hours. This process melts the lard which will then coat the fruit preventing fermentation taking place. 5. Remove the mincemeat from the oven and leave to cool completely, stirring now and then to stop the lard from setting in pools, you want to make sure the lard is evenly distributed and fully coats the fruit. 6. When the fruit is cool stir in the brandy and spoon in to your prepared jars. Cover with wax discs and seal tightly. Store the jars in a cool dry place until you are ready to use it. Try to give the mincemeat at least a few weeks to mellow and for the flavour to develop before using. Tis heading in to the festive season, apparently it is only six weeks to Christmas Eve but I am not going to check my calendar because I don’t need the truth to send me in to a panic. There are so many things to organise, mincemeat, puddings , the Christmas Cake that is definitely time to sit down and make a plan of action. I do love cooking for Christmas, for me it is less about getting everything ready for the main event, ie. Christmas Dinner but more about the little celebrations leading up to the day, mulled wine and mince pie parties, festive cocktails with pate, cheese and crackers and the lazy breakfasts when it is perfectly permissible to have left over venison terrine on toast slathered with a good chutney at 9am. This time of year is pickle and chutney time. Every year my Mum makes her own Piccalilli and my sister experiments with a variety of fruits and vegetable, anything from beetroot to plum to fig. 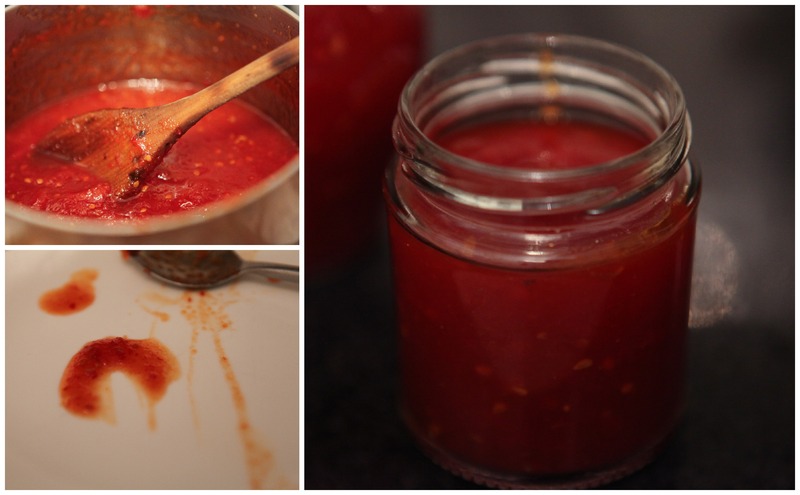 One of my favourite relishes to make and to eat is this Tomato and Chilli jam, this is gluten free, really simple to make and doesn’t contain too much vinegar so the simmering process will not sear the eyes from your head. This jam is good with most cheese but especially with a nice soft goat’s cheese. 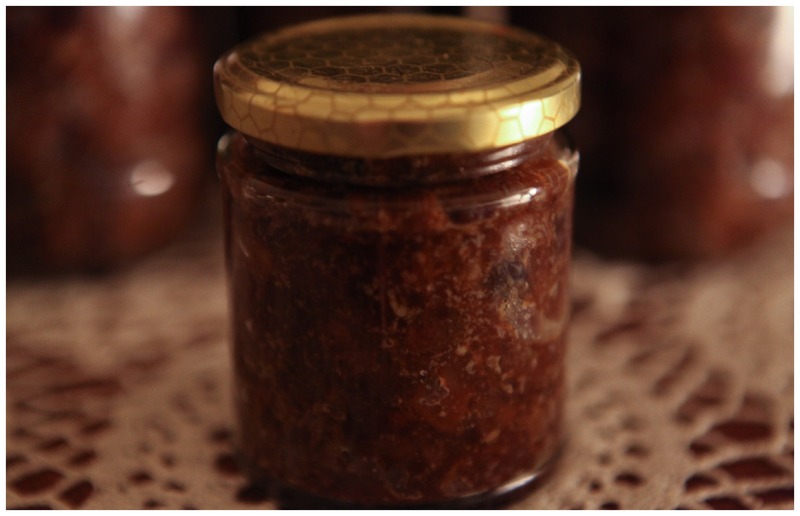 A jar of this would be a happy addition to any gift hamper you might be planning. If you sterilise your jars and seal them properly this jam should keep, unopened, in the fridge for a few months. To sterilise your jars wash them thoroughly in hot sudsy water, rinse them in hot water and then place them in your oven at a very low heat, Gas 1 or the equivalent and leave until they are completely dry. To create a good seal go out and invest in the waxed jam pot covers, they are cheap as chips and with the lid will proved a good seal for your jam. Set the diced tomatoes aside and place the intact ones in a blender or food mixer, add the chillies, fish sauce, ginger and garlic and blitz until you get a lovely pink puree. I used a jug and immersion blender for this and it worked perfectly. Pour the puree in to a heavy bottomed, high-sided pot and add the sugar and the vinegar. Bring the mix to the boil and stir, once the mixture has come to the boil reduce the heat down until the mix is at a gentle simmer and then add the diced tomatoes. While the mix is simmering skim off any scum that forms on the surface. 5. Cook the jam, at a simmer for an 1 ¼ to 1 ½ hours, stirring from time to time to prevent the jam from sticking to the base of the pot. 6. After 1 ¼ hours cooking test the jam by placing a little bit on a cold plate and leaving it set for a minute, test it by pushing it with your finger and seeing if it has started to set. 7. While the jam is still warm carefully pour it in to your warmed, sterilised jars, cover with the wax disc and close the lid tightly. Allow the jam to cool completely before putting it in the fridge. Enjoy with cold meats, terrines, pate’s and cheese! This has been a very long month, particularly if you are paid monthly, there are still nine days to payday and the cupboards and bank balance are looking grim. Add that to the weather and things seem quite cheerless however in these tough times it is good to remember dishes that forgo meat and are filling and warming without it. When I make lasagne I usually use either lamb mince or a combination of lamb and pork mince (since I can’t eat beef) but while a pack of lamb mince is €4.00 a pack of mushrooms can be anything from €0.99 to €2.49 and while that may not seem like much the pennies saved on meat can be spent on cheese, in this case gruyere. This lasagne is feels really decadent with its thick bechamel sauce and layers of cheese and while gruyere is beautiful with the mushroom filling you would be fine with parmesan or even cheddar if you are being really frugal. If you are looking for Gluten Free Lasagne try the Tesco Free From Pasta, it is are affordable and the same size as regular lasagne which is great, Dietary Specials also used to have good lasagnes sheets but I haven’t seen them in stock anywhere in ages. As an experiment I tried softening the pasta sheets in boiling water before adding them to the dish, this helped the top of the lasagne being too dry (this can sometimes happen with the GF pasta sheets) however I have since found that if you keep plenty of sauce aside to cover the top layer of pasta you won’t need to par- boil the pasta. 1 ½ lbs mushrooms, you can use plain button, chestnut, Portobello or any fancy mushroom you like! Add the mushrooms and saute over a medium heat until they are nicely softened and turning brown, you may need to do this in two batches. Add salt and pepper to tast and leave aside until you are ready to build the lasagne. 1. In a pan heat the milk with the carrot, celery rib, onion and pepper corns over a medium heat, let the milk come to a simmer and then reduce the heat to low and let the flavours of the vegetables infuse the milk while you are making your roux. 2. In another pan melt the butter, when melted and frothy add in the flour, stir to combine and allow to cook for one minute. 3. Pour the hot milk through a sieve in to a bowl and discard the vegetables and pepper corns. 4. Add the hot milk to the roux a ladle full at a time and whisk to combine. The roux will be quite thick and it make take a while to get a silky consistencey but keep with it, just be careful not to splatter yourself with hot milk! 5. When you have added all the milk cook the sauce over a medium heat until it has thickened, stir to make sure the sauce doesn’t catch on the bottom of the pan. 6. Stir in a good grating of nutmeg, the Dijon mustard and most of the grated cheese, keeping some aside to sprinkle of the top of the lasagne, add salt and pepper to taste. 1. Spread a tablespoon or so of your bechamel sauce on the base of your dish and cover with a layer of pasta, add more sauce and then a layer of mushrooms, repeat this process until you use up all the mushrooms. Cover with a final layer of pasta and cover this thickly with the remaining sauce and the rest of the grated cheese. 2. Bake in the preheated oven for 45 minutes until the pasta is cooked through and the top is golden. 3. Allow to sit for a few minutes before serving. On Wednesday I gave you a most indulgent desert recipe so today I am going to give you something a wee bit healthier, all things in moderation as they say. In my family my Mum never really had a problem making us eat vegetables even greens, at Christmas there is usually a standoff over the last few brussels sprouts even to this day. I like veggies and doing interesting things with them and so when I first heard about kale crisps and then saw the high price of a packet of kale crisps I decided that I would keep my money and try making my own. This is a really basic recipe and since you can now get big bags of kale in grocery stores for around €1.49 it is really cheap, you can vary this by changing the seasoning you use, I used garlic powder as it is what I had to hand but you should experiment to see what you would like, I have a chipotle rub spice mix that I really want to try with this. 2. Remove the centre stem which is quite tough and then either chop or tear the kale in to bite sized pieces. 3. 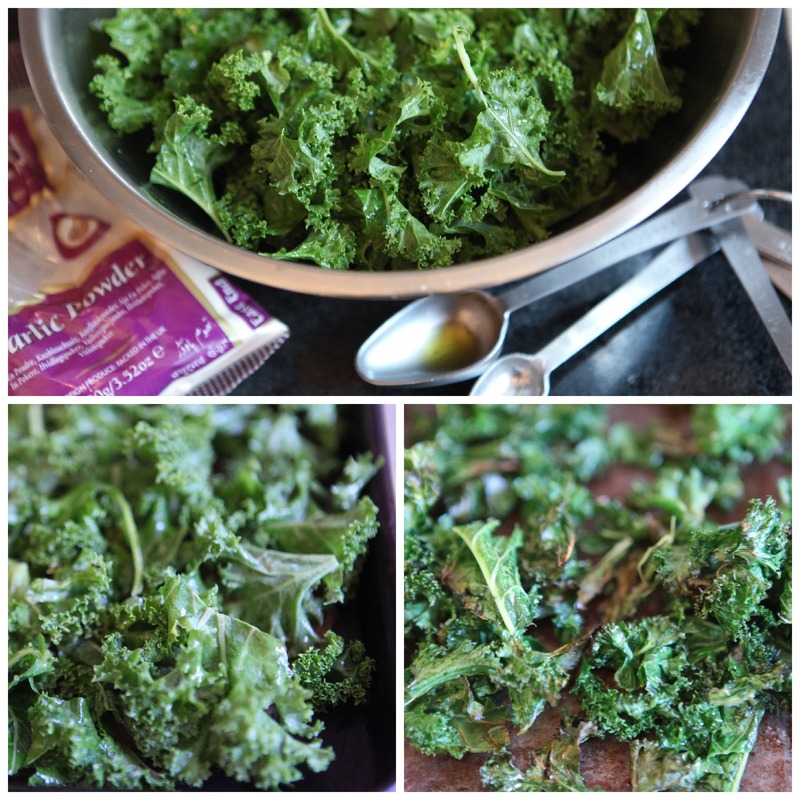 Put the kale in a bowl and pour over the olive oil, use your hands to mix and make sure the leaves are well coated. 4. Put the kale on a tray and sprinkle over the garlic powder or other seasoning. 5. Put the tray in the pre-heated oven and bake for 10 to 15 minutes, halfway through the cooking you should use a fork to mix the leaves around or those art the outer edge of the tray may burn. 6. When the kale pieces have crisped up remove from the oven and season with salt and pepper. If you aren’t going to eat the crisps straight away store them in an airtight tin. In a move that probably defeated the effort of making a healthy gluten free snack I enjoyed almost a full bowl of kale crisps with a Gluten Free beer while watching a movie, I recommend you try this. I would like to say that Autumn is well and truly upon us but although the leaves have turned and it looks like there should be a chill in the air the weather is still a bit too warm for my liking. I am looking forward to misty mornings and crisp afternoons followed by dark evenings fragrant with turf and wood fire smoke. While I love the flavors and freshness of Summer food I really like food that is comforting, that you can smuggle up with as the long evenings draw in and that is what Autumn and Winter cooking is all about. Soup is comfort food, hearty, filling and warming. There has been a resurgence in the popularity of soup lately. The stores are full of high quality fresh soups, fully of good ingredients and in so many more flavors than the tomato / mushroom / chicken canned or packet soups of yore. For all the good soups you can now buy there is still nothing like making your own at home. If you roast a chicken keep the carcass and make some stock, pop it in the freezer if you aren’t going to use it straight away and you will already be halfway to a good meal. If you don’t have time or inclination to make your own stock find a good gluten free stock, these are much easier to find than before although they are most likely stacked with the rest of the stocks rather than being in the Gluten Free section of your supermarket, just check the packet to make sure they are gluten free. 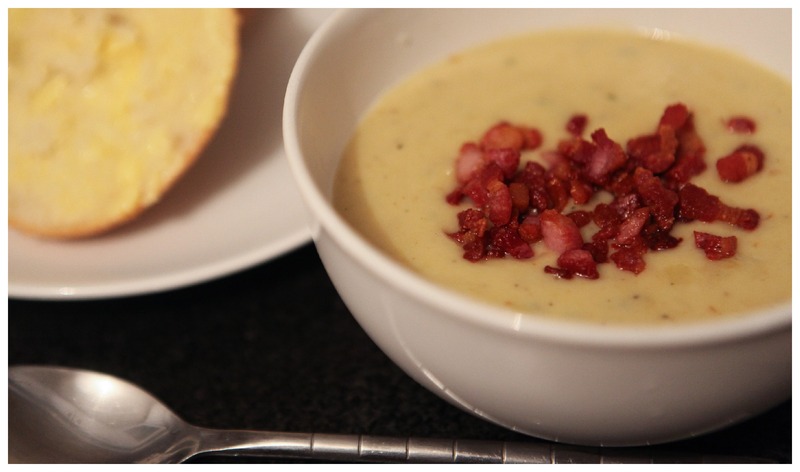 This Leek and Potato soup is very thick and velvety, I topped it with crisped pancetta that added a lovely salty crunch. You can thin the soup out with a little more stock or milk if you the consistency is too thick for your liking. 600ml of good quality Gluten Free chicken or vegetable stock, hot. Melt the butter in a heavy bottomed pot over a medium heat. Make a cartouche out of some grease proof paper and place in the pot, tightly covering the vegetables. cover the pot with a lid and reduce the heat to medium low and allow to cook for 10 minutes. Remove the cartouche and add the heated stock, bring to the boil and allow to simmer until the vegetables are tender and cooked through. Using an immersion or jug blender puree the soup, be careful not to splatter your self with the hot liquid! Stir in the milk, cream and thyme leaves. Check the seasoning. In a pan fry the pancetta in a splash of olive oil until crisp. Ladle the soup in to bowls and top with crispy pancetta. 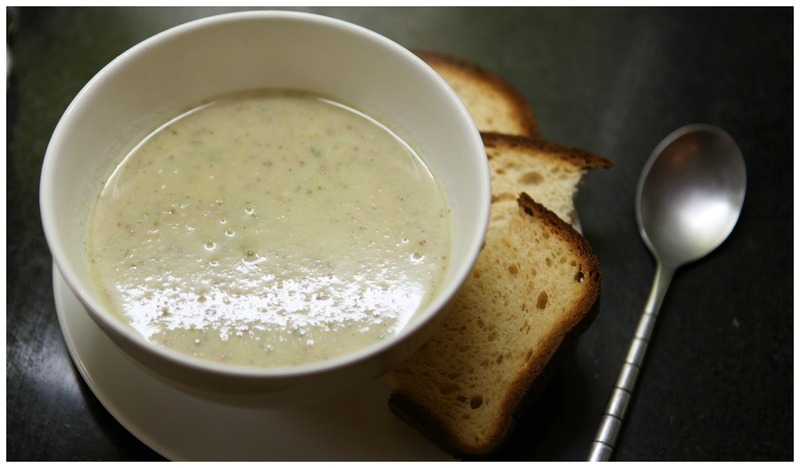 Serve this soup in little cups as a tasty starter or in big bowls with lots of bread for a fairly substantial meal. Savoury Pies are the best winter comfort food, topped with potatoes or pastry I am not fussy but there is something about pulling a bubbling golden pie out of the oven that makes me glad that the evenings are drawing in and the weather getting colder. Although we haven’t hit proper late autumn / winter weather quite yet I had a hankering for a chicken pie and when I saw that both leeks and mushrooms were on special offer I decided that this was a sign to go for it. 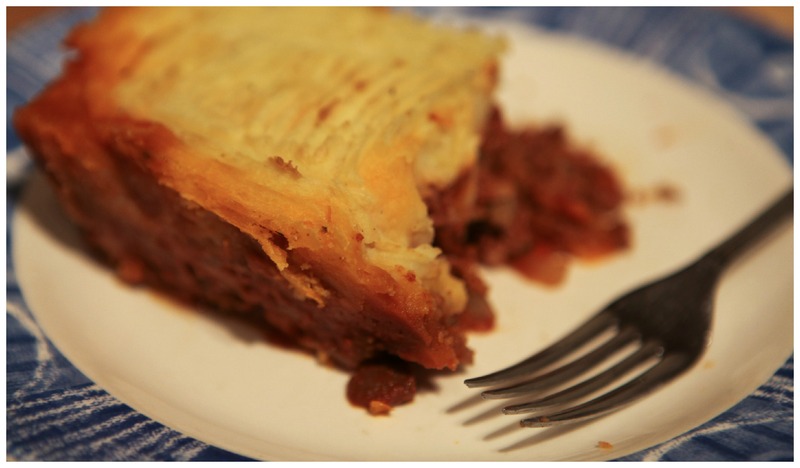 This is a very basic pie, the filling goes straight in to the dish and is topped with a pastry lid, rather than being completely enclosed in pastry. Enough ice water to mix. Wrap in cling film and place I the fridge to chill while you are making the filling. When your pie filling is ready take the pastry from the fridge and roll it out between two sheets of baking parchment to a size that fits the top of your casserole. Don’t make the pastry too thin, you want a good bit of pastry on your pie. Sour cream. I used a 200ml b but took out ¼ of a cup if that for the pastry. Heat the oil in a pan over a medium heat and add the onion, leek and mushrooms and cook for a few minutes until softened but not browned. Add in the bacon and chicken and cook until the bacon has rendered out all the lovely bacon fat and the chicken is cooked through. Stir in the sour cream and remove from the heat. Take out the thyme and pour the filing in to your casserole/ pie dish. You can butter the edge of the dish where the pastry will rest. Take the rolled out pastry lid and place it carefully over the casserole. Crimp the edges of the pastry and then make a little slit in the centre of the pie to allow the steam to escape. Serve this with some sweet petite pois and if it is a really wintery day go for some extra carbs and serve with buttery mashed potatoes. One of the things I look forward too when I win the lottery and can afford to buy a house of my own is growing my own fruit and veg. My partner’s Mum has a garden full of fresh grown produce. There are many varieties of herbs, courgettes with their beautiful blossoms, tomatoes, brussels sprouts, strawberries, rhubarb … so much good stuff. I love the idea of being able to go in to the garden and grab some salad leaves and herbs for dinner and I always appreciate it when people gift me something they have home grown. The last week I was delighted to get an unexpected present of two beautifully ripe figs that were grown in a back-garden down in Limerick. I didn’t know you could grow figs in Ireland but now that I do a fig tree has definitely made it on to my dream house wish list. Fresh figs are amazing, the first fresh fig I had was courtesy of my sister Deborah, the figs were poached in a spiced syrup and served with cream and that dish still ranks as one of the best deserts I have ever had. Although they are great in sweet dishes figs also work really well with savoury flavours and one of my favourite ways to serve figs is with goats cheese and Parma ham. While I only had two figs that I pretty much scoffed by myself, grudgingly sharing a few bites, the quantities I will give here would do four people if served as a starter with a few nicely dressed salad leaves. 3 fresh ripe figs, quartered. This will give you 12 quarters and each person gets 3 quarters. 12 teaspoons of soft goats cheese. I teaspoon per fig quarter. This is hardly a recipe as it is so simple. Place a teaspoon of the soft goats chees in the divot. Take a strip of the torn, or if you like things to be even, sliced, Parma ham and wrap it around the fig and cheese. Place the figs on a baking sheet and pop in the pre- heated oven for ten minutes until the figs are heated through and the ham has started to crisp up. Serve warm, with some dressed leaves as a starter or place on a serving tray as a delicious nibble to go with drinks. A roast dinner is a pretty good option if you are expecting Gluten Free guests. Throw a chicken in the oven, roast some spuds choose from a variety of vegetable sides and congratulate your-self on a job well done. If you find the right recipe a roast dinner can also be something you can pop in the oven and forget about for the duration of the cooking time which is great for those lazy Sundays when all you want to do is relax before the working week begins again. 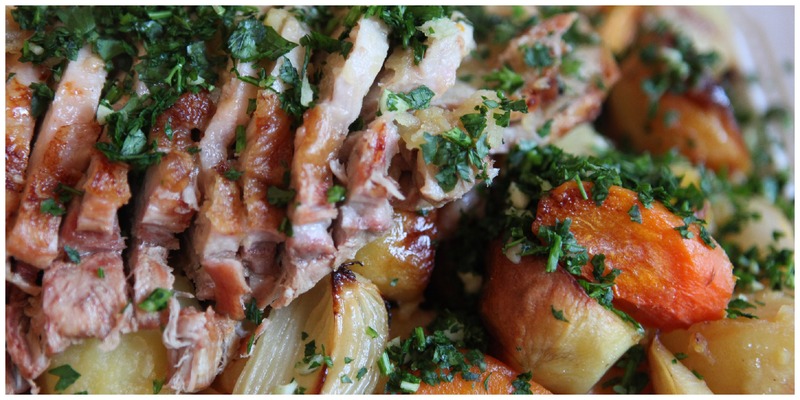 This recipe is a variation on the lovingly named Grandma Barbe’s Roast Pork from the beautiful Pork & Sons by Stephane Reynaud. This lovely book is full of recipes for dealing with any cut of pork, ham or bacon. If you love the smell of crisply cooked bacon than this is the book for you. The original recipe calls for cooking this in a casserole on the hob but unfortunately I don’t have a casserole big enough and in fact because I have a tiny oven I have to divide the vegetables between two roasting dishes, always ladling in a good deal of the meat juices in to the veggie only dish. 1 pork fillet, ask your butcher for a piece big enough for 6 people as that is what this recipe will feed. Heat the olive oil in a frying pan and brown the pork on all sides, turning carefully and swearing every time you get spattered with oil. Place the pork and all the oils and meat juices from the pan in a roasting dish, cover with tinfoil and place in the preheated oven for 1 &1/2 hours. After this time add the prepped vegetables, wine, butter and bay leaves to the roasting dish, turning the vegetables so they are covered with all of the lovely cooking liquor. Replace the tinfoil and pop the roasting dish back in the oven for another half hour or until the potatoes are tender and cooked and the pork is cooked through. Use a meat thermometer if you have one. Season to taste. Remove the tinfoil and leave the dish in the oven for another 10 minutes until the potatoes get some nice crispy edges. Remove the dish for the oven and recover it with tinfoil and allow the meat to rest. Slice the pork and place on a warmed serving platter and arrange the vegetables around the meat, sprinkle with the parsley / garlic mix and present to your guest who should be suitable impressed. If you are lucky and you don’t have to get up for work, kids, pets or a serious commitment to working out in the morning, weekends are for waking up slowly, sipping the first cup of coffee, hopefully delivered in to your hands before you even properly open your eyes, while contemplating the pleasures of a whole day ahead of you with no work. Breakfast or better yet brunch should be a leisurely affair, the perfect combination of food and relaxation. As my mid -week breakfast tends to be a smoothie gulped down in between getting dressed and legging it out the door for work I like to take my time over prepping breakfast on the weekend. 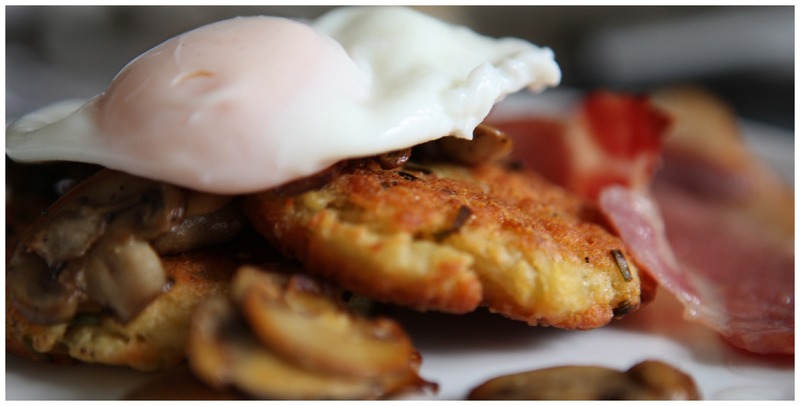 Potato Rosti are a great basis on which to build a breakfast and if you don’t add flour they are naturally gluten free. You could have them with sausages, bacon and eggs, topped with a pile of golden fried mushrooms, asparagus and hollandaise sauce or crème fraiche and smoked salmon. This is pretty much a no recipe recipe and you can use as many potatoes as you have people for breakfast. All you need is potatoes, a grater, some oil and a frying pan. Here I have used one medium and two small potatoes to make two rosti each for two people. Some recipes call for flour and some don’t. I have added a level tablespoon here but if you don’t keep gluten free flour in your cupboard and are making this for a celiac friend who happened to stop over you can leave it out. I also added chives, a bit on onion salt and some parmesan ( I always do my best to find a way to add cheese to any recipe) but all of these are optional and you could replace the chives with any herb of your choice. Grate the potatoes in to a bowel. If you have a muslin square or a clean cotton tea towel use this to squeeze the grated potato to remove the liquid. You can use your hands for this, just take a bit of time and squeeze out as much liquid as you can. You will be surprised at how much water there is in a potato! Put the grated, squeezed potato in a bowl and break it up with a fork. Add the flour, cheese, chives, onion salt and salt and pepper to the potato and mix thoroughly. Divide the potato mix in to four equal parts and form each into patties with your hand. Place in the heated pan and cook for 2 ½ minutes. Turn the rosti and cook for a further 2 ½ minutes before placing in the pre heated oven for 15 minutes until cooked through. If you have a cast iron pan that can go in to your oven that would be perfect for this. If not you can put the browned rosti on a baking sheet in your oven. You could cook the rosti on the hob, turning regularly until cooked through but I like to pop them in the oven to finish cooking so I can work on the accompanying dishes. 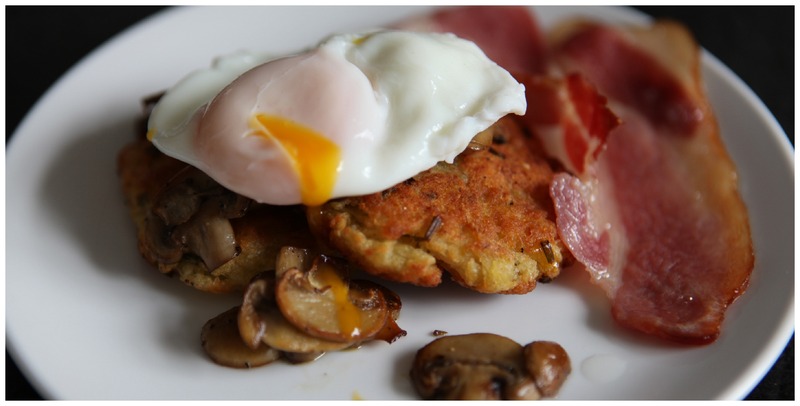 I served these rosti with some crisp bacon, lovely fried mushrooms and a poached egg but as I said rosti are very versatile and are a great alternative to bread if you are looking for a nice carby way to start the day. Once you have a good gluten free pastry recipe tarts are a great idea for starters, picnics and party food. I love savoury tarts and in particular I love this red onion and goats cheese version, the sweetness of the onions works so well with the cheese. This is a good recipe to prep for a dinner party as you can caramelise the onions, make the pastry and line your tart tin the day before so you just have to blind bake and then fill the tart shell the day of your party with no floury mess to clean up. Mix together the flour, salt and xanthan gum in a bowl. Add enough cold water to bring the dough together. Wrap in cling film and chill for a half an hour. Roll out the pastry to fit your tin or simply press the pastry in to a buttered loose bottom tart tin. If making the pastry the day before you need I you can cover the pastry lined tin with cling film and leave it in the fridge until you are ready to use it. To blind bake the pastry shell, heat your oven to Gas 5/190c/375. Line the pastry shell with parchment paper and fill with baking beans. Cook in the pre heated oven for 20 minutes. Once cooked carefully remove the parchment paper and baking beans and leave the shell to rest for a few minutes. 5 tablespoons of olive oil. Heat the oil over a moderate heat and add the onions and star anise. Stir to coat them with the oil. Add the brown sugar and vinegar and season to taste. A bit of grated parmesan, this is totally optional but I will never say no to extra cheese. Slice the goats cheese, or crumble it with your fingers and arrange over the onions. Add the salt and pepper to the beaten eggs and pour into the tart shell. Place the tart in the oven and cook for 25 to 30 minutes until the egg is set and the top is golden. The tart is best served warm with a nice side salad but is also delicious cold for a picnic. Although I have strong opinions on many things, a lot of them disapproving I cannot bring myself to disapprove of Gwyneth Paltrow. This tends to surprise people, I recently had a friend give an audible gasp when I mentioned that not only had I bought her book, It’s All Good, but that I think it is a genuinely good cookbook. With all the actual bad people there are in the world I just can’t bring myself to spend my time critiquing an actress who does a nice side-line in cooking. I know people have issues with her lifestyle and her blog and think that she is oblivious to the privilege granted her through her wealth and career. I think she is fully aware of her privilege and is simply honest about the life she is able to live with that privilege. If that annoys you then so be it but it doesn’t take from the fact that she has written a nice book full of good family friendly recipes that are slanted towards the gluten free diet which I appreciate. I also have a soft spot for Margot Tenenbaum and Pepper Potts so there is that. I bought the book a while back as I liked the look of it and it was reduced to €9, always a winning combination for me. I have cooked quite a few recipes out of it and they have all worked well so I know there has been a good amount of recipe testing, this is not something that can be said about all cook books unfortunately. This is a really good book for anyone with gluten or dairy issues as all of the recipes are adapted for GF and are dairy free. 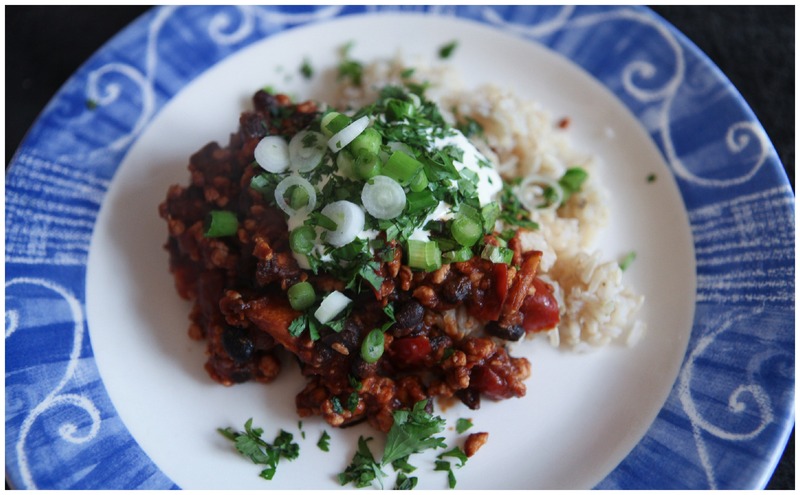 One dish I have cooked a couple of times is the turkey chili, this is a really flavoursome dish that doesn’t have the heat you would expect from chili so it is good to cook if you are serving children or anyone else who doesn’t like too much heat. I like a bit of a smoky chili hit so I add a teaspoon of chipotle in adobo sauce. Turkey, Sweet Potato and Black Bean Chili. Serves four generously or two with enough left over for a couple of lunches. Finely chopped coriander, chopped spring onions and sour cream to serve. Omit the sour cream if you want this to be dairy free. Toss the diced sweet potato with 2 tablespoons of oil, sprinkle with salt and put in the oven for twenty minutes until they are cooked through and golden. Heat the remaining 2 tablespoons of oil in a pan and add your diced onion, crushed garlic and spices. Cook over a medium heat for about 8 minutes until the onions are softened but not browned. Add the minced turkey, breaking the meat down with a wooden spoon. Allow the meat to cook and brown for twenty minutes until any liquid it releases has evaporated. This may seem like a long time but it will give the meat a nice flavour. Add the tinned tomatoes and the ½ cup of water, do try to use hot water so you aren’t reducing the temperature in your cooking pan. Bring to the boil and allow to cook uncover for twenty minutes. Again this will seem like a long time but it you are bringing all the flavours together and reducing the sauce down to concentrate those flavours. Add the cooked sweet potatoes and the rinsed beans and stir through the sauce. Add salt and pepper to taste and allow the sauce to simmer over a low heat for about 15 minutes to allow everything come together. Although this chili is substantial enough to eat on its own you could serve it with rice or tortilla chips. The first time I had cucumber pickle was back in the Farm Gate Restaurant in the English Market in Cork many a year ago. I love it, I am a big pickle fan, gherkins to Rollmops (pickled herrings) I love anything brined or pickled. Cucumber pickle is big with my family, my sister makes several jars at a time and they don’t last long. Alas I live with someone who hates cucumber, pickled or not, apparently it tastes green and like grass so I tend to make this pickle only when I have a few guests coming over. 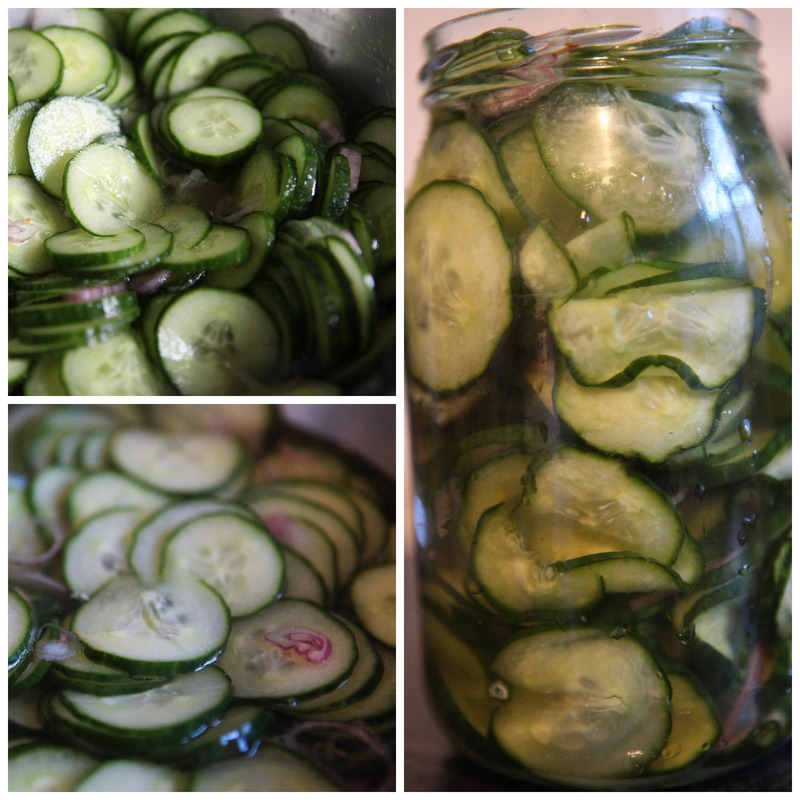 The recipe I use is the Ballymaloe Cucumber Pickle from Rachel Allen’s book Entertaining At Home. There are variations you can make, adding dill etc. however this is my favourite recipe. This recipe makes a good quantity of pickle so if you aren’t going to use it in one go store the pickle in sterilised jars in the fridge. If you can bear to part with it this also makes a lovely addition to any foodie gift hampers you may be putting together. 8 fluid ounces / 225 ml of ether cider or white wine vinegar. I prefer white wine vinegar. 1. Wash and finely slice your cucumber. You can use a mandolin if you have one or just take a bt of time with your sharpest knife. 2. Put the cucumber in a bowl and add the sliced onion, salt sugar and vinegar. 3. Mix thoroughly with spoon until the cucumber is fully coated in the vinegar, sugar mix. Don’t worry if it seems dry the cucumber will make its own liquid as it brines. 4. Cover the bowl with foil or cling film and leave for a few hours after which there should be a lot of liquid in the bowl. 5. If you aren’t going to serve this straight away you can store the pickle in well washed jars that have been sterilised at a low heat in the oven. The pickle should last about a week in the fridge. It is great served in sandwiches, as part of a salad buffet, with barbequed meat or with salmon, smoked or fresh. It is sweet, tangy, pretty and very moreish. I think we can safely say that we have hit irish Summer. People are scrambling to have BBQ’s, picnics and garden parties while the weather allows and every beer garden or pub with the foresight to throw a few chairs outside on the footpath is thronged with people leaning back, relaxed and enjoying the opportunity to wear their sunglasses. Staying with a Summer theme these pork skewers are great for cooking on a BBQ or indoors under the grill. The combination or pork and pineapple always works and the aroma of the pineapple slowly caramelizing over or under the grill is amazing. If you have the time prep the pork early in the day or the night before and leave in the fridge so the pork can marinate in the flavors. If you are using wooden skewers remember to soak them in water in advance of grilling so that they don’t burn. If you have a food processor combine the ingredients and pulse until you have paste. If doing this by hand, grate the ginger and garlic into a bowl. 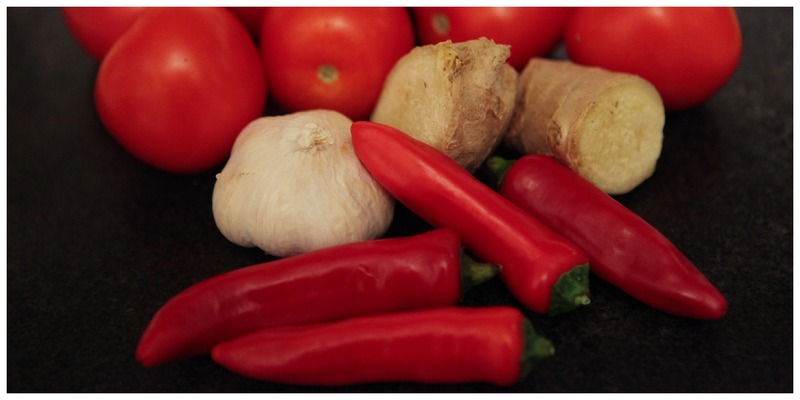 Finely chop the coriander and add to the garlic & ginger together with the chopped chili. Then add the liquid ingredients & lime zest and stir together. Trim the pork fillet and cut into cubes of about 1.5 inches squared. Add the pork to the marinade and mix together will, cover and leave in the fridge overnight or at least an hour. When the pork is ready peel and core the pineapple and cut in to 1.5 inch pieces. Add the pineapple, onion and red pepper to the pork and stir through. Heat your grill and take the soaked wooden skewers and start putting the skewers together, alternating the pork and vegetables. 7 Brush the skewers with oil and then place under the grill or over your bbq. Turn the skewers as the meat and veg start to brown. Keep the bowl of marinade nearby and every time you turn the skewers brush them with the marinade. Keep turning the skewers until all sides are cooked. Depending on your grill / bbq this could take between 30 and 40 minutes. Test to make sure the pork is cooked through. Serve the skewers with limes that have been cut in to wedges and any side you want, from rice to salad, wedges or pitta breads. Well the sun is trying its damnedest to make Summer happen so I am going to try and keep a summer vibe going in my cooking. This means going for salads with lots of bright colours; multi- colour cherry tomatoes, glistening black olives, yellow mangos, lovely green olive oils, red chillies and mountains of green leaves. I love salads, not the basic butter-head lettuce, wedge of tomato, bit of hard- boiled egg and slice of cooked ham that was salad to most people in Ireland for much of my childhood but the kind of anything goes salad that combines texture, colour and flavour in way that is immensely satisfying. If my memory is correct I first had a version of a mango and tomato salad at dinner cooked by my sister Deborah. The sweetness of the mango with the tomatoes and the lime juice make for an amazing combination and works well with burgers, pork chops, grilled chicken or fish. It is a good side dish to pretty much any kind of BBQ meat. Lamb burgers are a favourite of mine as for some reason I can’t digest beef anymore, I have a momentary pang of sorrow every time I fry up a steak for some lucky dinner guest. Pork and turkey burgers have their place but only lamb replicates the juiciness of a good beef burger, I know it is because of the fat content and I have made my peace with that, sometimes flavour wins over other concerns. These burgers with a high garlic content, a good whack of coriander, a hit of chilli and crumbled feta are a great alternative to a regular hamburger. They are great served with in a bun or pitta bread or just with a salad and work really well with the mango & tomato salad and a good dollop of crème fraiche instead of mayonnaise. 100grms of feta cheese ( ½ standard pack) crumbled or diced. 1. Mix all the ingredients together in a bowl and form into patties, you will get four burgers out of this amount of meat. When shaping the patties remember that the lamb will shrink up as the burgers are cooking so press them out as much as possible so you don’t end up with a marble sized burger lost in a giant bun. 2. Heat about a teaspoon of oil in a pan, the lamb will release a terrifying amount of fat as the meat cooks so you don’t need a lot of oil in there as the fat will render out of the meat fairy quickly. If you would rather you can grill these burgers as well, just keep turning them regularly and check make sure they are cooked through before serving. When frying I cook the burgers over a high heat to brown on each side and then turn the heat down and cover the pan with a lid for 15 / 20 minutes. I then remove the lid a cook for a further 5 minutes. The cooking time depends on the thickness of the burgers so if you have flattened your out well they will take less time. 3 regular sized or a cup of cherry tomatoes, diced, I don’t deseed or peel these as life is short and I don’t mind tomato seeds. Mix everything together in a bowl, this is a very technical recipe isn’t it. Add the lime juice and enough honey/ sugar to get a nice even mix of sweet and sour. Salt and pepper to taste and leave for a few minutes for the flavours to come together. As I said you can serve the burgers topped with the mango & tomato salad in a bun or pitta with crème fraiche, or with a big green salad and some potato wedges. As I am writing this the sun is beaming, I have the windows open and music playing and it feels like summer has arrived. People are wandering around trying to find a beer garden or any spot in the sun. Irish people tend to be thrown in to a blind panic when the sun comes out, it is almost as if we have to fit in as many summer activities as possible before the clouds move in. On these precious sunny days I crave mediterranean flavours. Olives, tomatoes, basil, lemons, garlic all washed down with a cold crisp white wine. I want my kip of a garden to suddenly become fabulous so I can eat outside and I want to be miraculously waxed, tanned and dressed in the kind of light summer dress ubiquitous in 1950’s Italian and French movies. If I can’t have the full fantasy I can at least have the food. As the previous day had been a bit grim I had some fish and leeks ready for a warming fish pie, but today’s weather is not for comfort food. I stopped off on the way home and picked up some things that would make a light bean stew to go with the fish I already had in the fridge. I got some fresh cherry and a tub of semi sundried tomatoes, a jar of olives, a tin of butter beans, a bulb of fennel, a lemon and a bottle of white wine. I also picked up some of the Goodness Grain Olive & Tomato Gluten Free Bread. I like to have nice bread to mop up any lemony, olive oil juices that are left after dinners like this and this bread is good stuff. It is soft and full of flavor and doesn’t need to be toasted. A loaf of this bread and a pound of butter and I would happily eat myself up a dress size. This is less a recipe and more of a few handfuls of tasty things thrown together in a pan and coming together to make a light, tasty summer dinner for two, perfect for a sunny evening. A hand full of parsley, finely chopped. Heat a pan and add a splash of olive oil and gently fry the shallots, garlic and fennel. You don’t want them to brown so cook them over a medium heat until translucent and soft. Stir in the butter beans and heat through. Add the tomatoes, cherry and sun dried and the olives and stir. Add a good splash of white wine and the chopped parsley and allow everything to simmer try gently. You aren’t really cooking this just warming everything through and letting the flavours mingle. Add salt and pepper to taste. In another pan heat the butter and a another splash of oil. When the butter is hot and foaming add your prepared fish fillets. Cook over a medium heat until the the fish is nicely golden on one side and then gently turn the fish over. Continue to fry until the fish is cooked through. This will only take a few minutes but will depend of the thickness of the fillets. If you are nervous just use a fork to flake the fish gently to see if it is cooked through. You can either serve the fish on a plate and spoon over the bean stew or you could nestle the fish in to the bean stew and serve it in the cooking pan. Serve the lemon quarters separately so people can squeeze over as much or as little lemon juice as they like. Enjoy with the some good bread to soak up any juices and the wine of your choice, in whatever patch of sun you can find with some good company and pretend you are on holidays. A trend could be spotted in my cooking and that would be for one pot meals that can be served in a bowl. Although technically we are in early Summer let’s face it the rain is still going strong and when I get home damp on a drizzly evening all I want is a dinner that can be eaten while curled on the couch under a blanket. This is also a fairly frugal meal, a handy thing as we are in the final stretch of a five week month and the coffers are empty. This recipe feeds four for dinner or two with lunches. It also survives freezing and reheating very well. You can substitute two chicken breasts for the chicken thighs if you don’t fancy shredding meat off the bone however the thighs make this better. Just as you would use a chicken carcass or wings and thighs to make stock, simmering all that flavour from the bones, so here we are getting a much richer sauce with the thighs than with chicken breast. Thighs are also cheaper. 1000g Chicken thighs or one standard supermarket pack. 1/2 red chilli deseeded and finely chopped, you can use a whole chilli if you like things a bit hotter. Heat a good splash of olive oil in a wide bottomed, deep pan or pot. You may notice from the accompanying photos that I started in a shallow pan and end up transferring everything in to a my bit soup pot, this was me not paying attention to what I was doing. Brown the chicken thighs on both sides. Do three or four at a time, don’t over crowd the pot. This flavours the meet and also renders out some of the lovely chicken fat from the skin. If using the breasts skip this step. 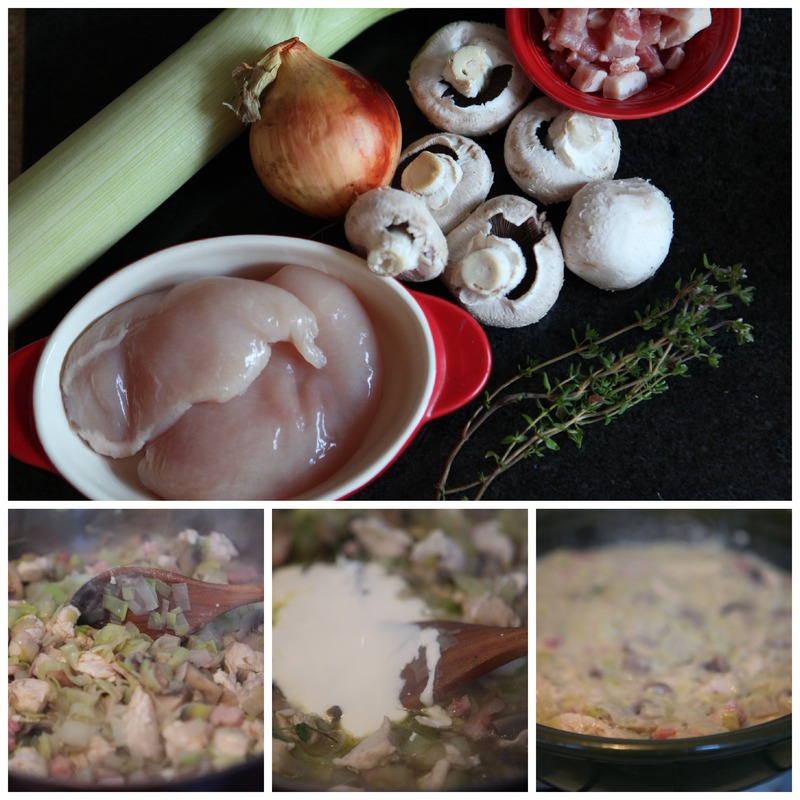 Set the chicken thighs aside but do not clean out the pot, you want to keep all the flavours from the chicken. In to the lovely chicken fat in the pot add the onion, pepper and fresh chill. Stir over a medium heat until the vegetables are softened but not browned. Sir in the garlic and the potatoes and cook for a few minutes more. Add the ground cumin and the mild chile powder and stir so everything is coated in the spices. Pour over the GF stock and then return the chicken thighs to the pot. If using chicken breast you can add them raw to the sauce at this point. Bring to the boil and then half cover the pot and reduce to a simmer. Simmer for twenty minutes and then test the thighs and the potatoes, the meat should easily pull from the thigh bones and the potatoes should be tender. If you don’t feel the thighs are cooked enough then cook for a further ten minutes. Once the meat is cooked remove the thighs (or breast) from the pot and place on a chopping board. Using a fork pull of the skin and discard, then remove as much of the meat from the bones as you can and tear in to shreds using two forks. Return the meat to the pot and then add the spinach. Stir until the spinach is wilted and then add salt and pepper to taste. Ladle in to bowls, add a good dollop of sour cream and enjoy! However I do miss cooking shows, in particular I miss finding out about new chefs and bakers whose books I might like and as so many cook books are now tied in with TV shows I sometimes feel behind the curve on what is out there. Tyler Florence is one of the chefs I might have missed out on if my sister Deb hadn’t had a pot of this soup on the stove one weekend while I was in Cork. Easily adaptable for gluten free, just use GF pasta and stock, this soup is amazingly flavoursome and the perfect kind of food for this kind of mixed up rainy Spring weather. Snuggle up with a bowl of this, a good shaving of parmesan cheese, a glass of red wine and a book and you will be happy. This makes six servings and reheats well the next day but will be more of a stew than a soup as the pasta will absorb the stock over night. 8 fresh sage leaves, I know these can be hard to get but they do make the difference. I have once or twice substituted and teaspoon of dried Sage and the world did not end. Put the GF chicken stock and the halved head of garlic in a pot and simmer for about 15 mins, remove the garlic with a straining spoon and keep the stock warm. Boil a large pot of salted water for the pasta. Pour the 1/4 cup of olive oil in a soup pot or big saucepan. Add the sage, rosemary and thyme and warm in the oil over a medium heat for three to four minutes. 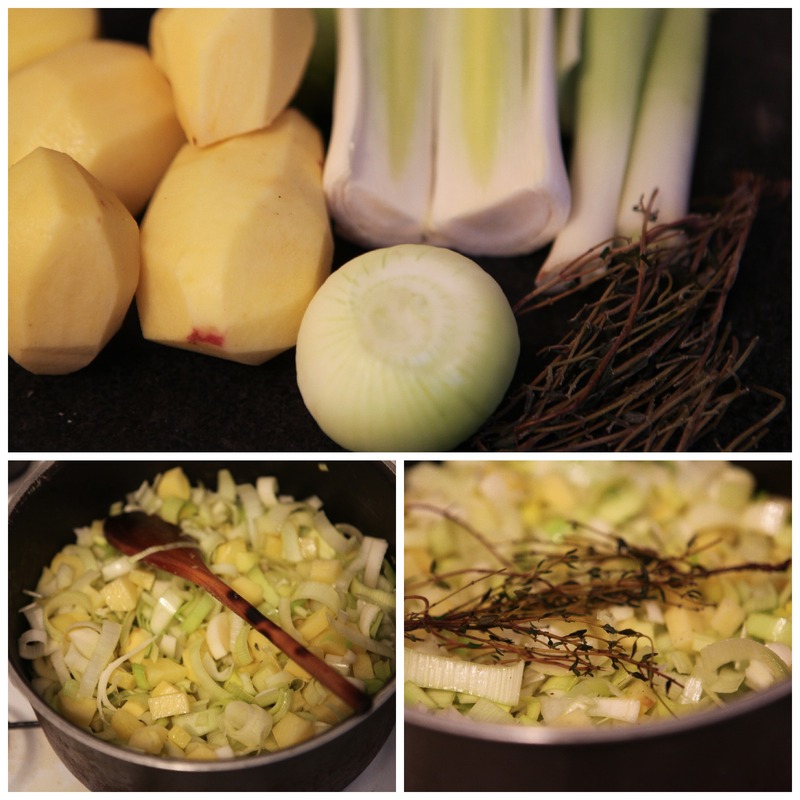 This will infuse the oil with the flavour of the herbs and is what makes this soup a bit special. 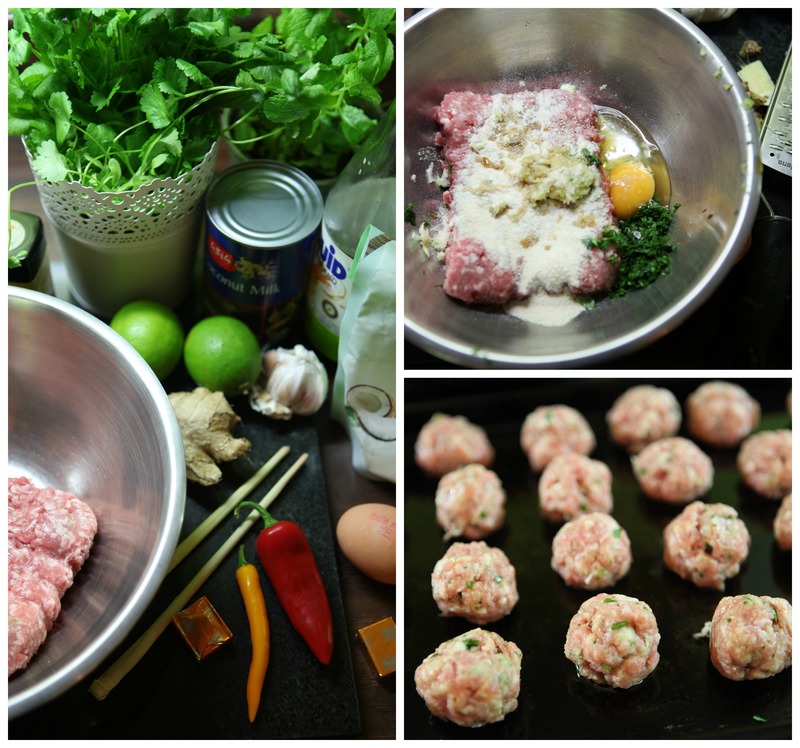 Add the minced pork to the pot with the herbs and break it up with a wooden spoon, mixing until the pork is browned. Add the chopped vegetables and cook for three to four minutes until they are softened but not browned. 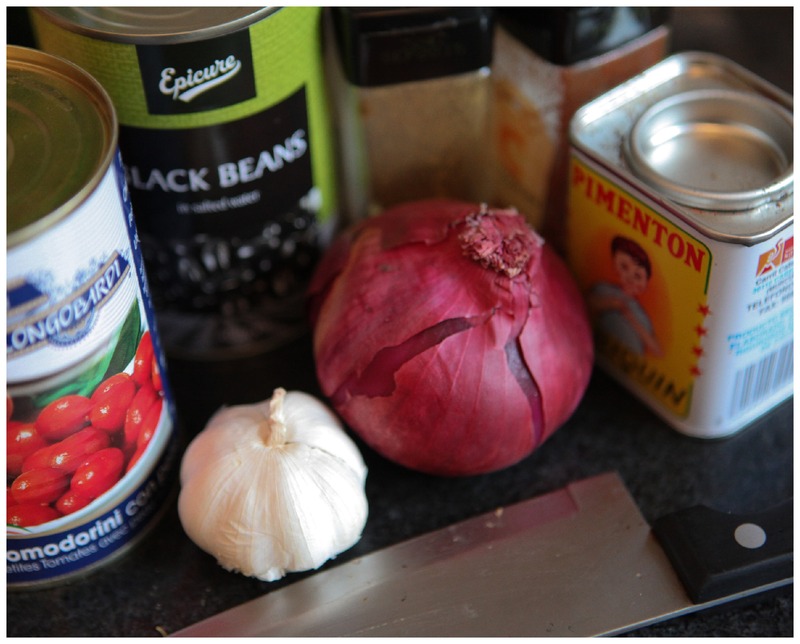 Pour in the chopped tomatoes, the cannelloni beans and the stock and add the bay leaf. Bring to a simmer and leave to simmer for fifteen minutes, stirring every now and then. While the soup is cooking add the pasta to the pot of water you have boiling. Cook the pasta for about six or seven minutes, until it is just slightly under done. Drain the pasta. Before adding the pasta to the soup fish out the thyme and rosemary stalks and the bay leaf. Add the pasta to the soup along with the parsley and salt and pepper to taste. Mr Florence serves his soup with slices of parmesan coated toasted baguette but I find that this soup with the beans and pasta is filling enough and all it really needs is a good sprinkling of parmesan cheese. We were gifted a slow cooker a few years ago and while it is something I don’t think I would have gone out of my way to buy I do love using it. There is something about coming home to the aroma of cooked dinner after a log day at work that is just lovely. 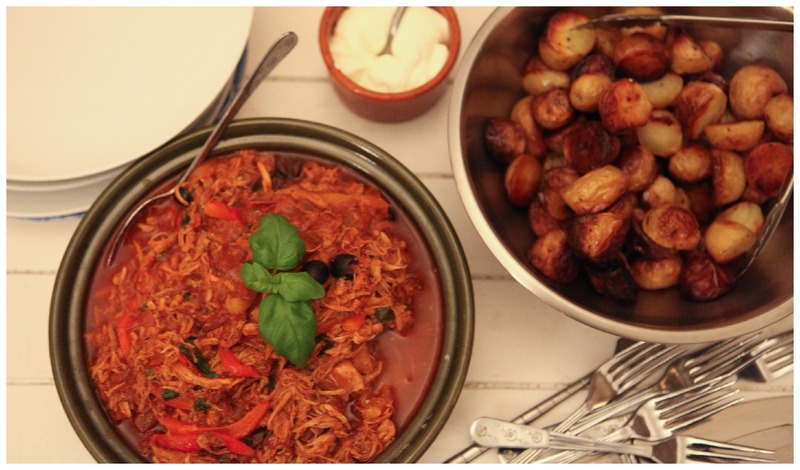 There are a lot of slow cooker recipes out there but this is something I came up with for Valentines dinner this year as dinner had to be fast since we were heading out to the cinema, very romantic. I prepped it in the morning before I headed to work and left the house starving as everything smelled so good. I doubled the recipe a week later when we were having people over for dinner and those are the quantities I am giving here. • 2 pork fillets, you could use pork shoulder instead. Turn the slow cooker on to low. 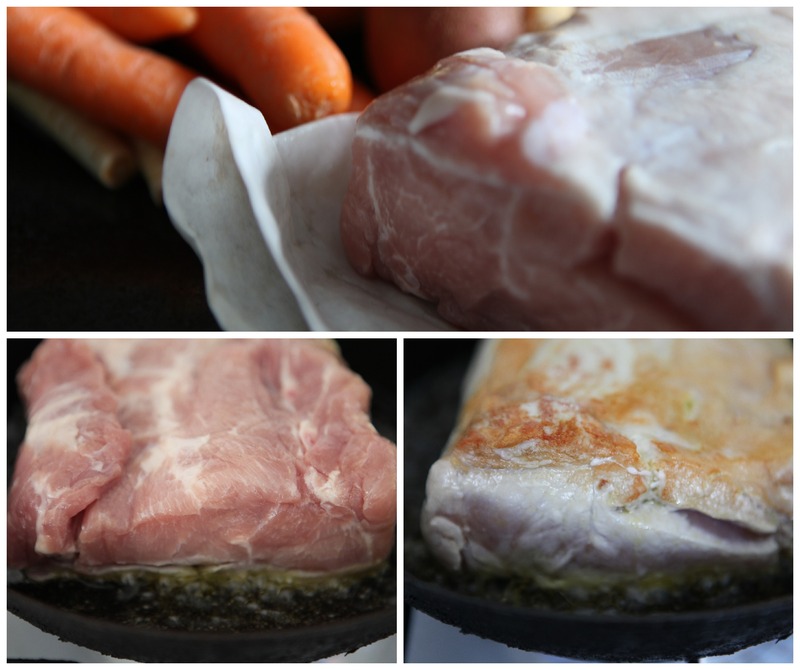 Trim the pork fillet, removing the silvery membrane and then cut each fillet in to four pieces. Heat the olive oil in a pan and brown the pork on all sides, remove from the pan and place in the slow cooker. Add the red wine and leave to bubble a minute, then stir in the passata, chicken stock and brown sugar. Add the thyme and bay leaves and pour in to the slow cooker. Put on the lid and leave this to cook on low for 8 hours. When you get in or an hour before you want to eat you could pop the heat up to high just to thicken the sauce if you wanted to. The pork should fall apart when you touch it, shred it in to the sauce with two forks. Season to taste. Grill the oiled peppers or roast them in the oven until the skin is black and blistered. Put in a plastic food bag to allow the steam to loosen the skin, then peel, deseed and slice in to strips. Stir in to the shredded pork along with the olives and the torn basil leaves. I served this with some baby potatoes I halved and roasted in some olive oil for about a half an hour until golden and cooked through. Sour cream works really well with the sauce. You could also serve this with some wraps either corn or GF tortillas or taco shells topped with sour cream and grated cheese. This recipe came from a team building exercise in my old job of all places. It was an American company and this was taken extremely seriously by HR, so I had to run out and buy two mobile stove tops and the entire office was divided in to two teams and sent off to the supermarket with a very tight budget to get ingredients for a meal we had about five minutes to plan. An early version of this recipe was the result of our collaboration and (go my team!) we won the exercise. It was very loosely based on the memory of something delicious that someone had eaten while in Spain on holiday. I have adjusted this over the years, adding different things, sometimes using chicken or pork with the chorizo and adding spinach and olives. It is a dish that lends itself to tweaking. It is also a really quick mid- week dinner that won’t break the bank and reheats beautifully for lunch the next day. The following recipe will serve four (six if served with lots of crusty bread) or two with enough left over for two lunches. 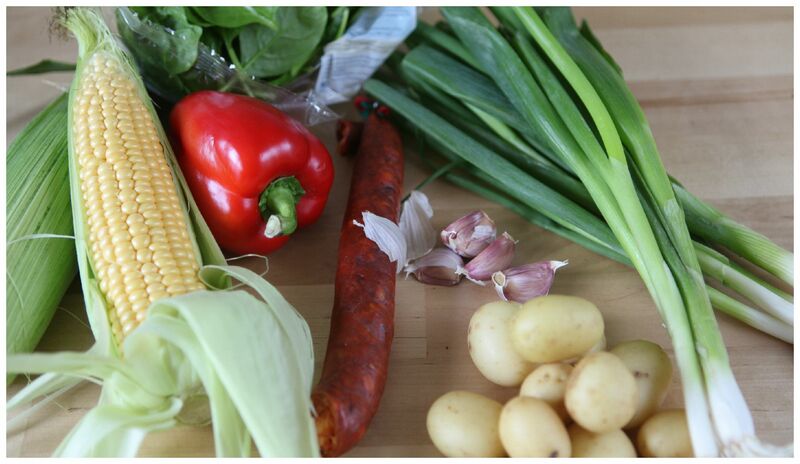 170 – 200 grams of chorizo cut in to ½ centimetre slices. I use the whole chorizo for this rather than pre sliced as it gives a better texture to the finished dish. Heat the oil over a medium heat and add the onion and celery. Cook until softened but not browned and add the garlic, pepper and chorizo. Continue to stir over a medium heat until the chorizo starts to release its oil and your kitchen starts to smell amazing. Add the tinned tomatoes, the tomato puree and the brown sugar. Stir in the stock and the chickpeas and bring to the boil. Reduce the heat and leave to gently simmer for 15 minutes. Add the spinach and olives and season with salt and pepper. Serve in warmed bowls with a good dollop of sour cream. Tis the week before pay day and all through the house people are checking their pockets for loose change to buy groceries. That is usually how it goes in my house anyway. I do try to budget throughout the month so that this doesn’t happen but something always comes up, a birthday, tickets to something I really want to see go on sale or I have a particularly delightful day at work and need to ease the pain with some wine in the evening. Budget blown. For just such occasions I have a collection of dinners that are really cheap to make. They aren’t fancy and they may not be pretty but they get the job done and taste good . This one is an old standby, originally made with tinned mushroom soup but here adapted for a gluten free diet. 250 grams GF pasta, something small like penne. 170 grams / 6 oz mushrooms, most of a standard container if you don’t feel like weighing. Chop the onions or shallots and add to the pan, cook for a few minutes until softened. Slice the mushroom and add to the pan with the garlic. Cook until the mushrooms start to brown and soften, stirring every now and then to make sure they don’t stick and then add the 300ml of milk. Turn up the heat and when the milk has heated until small bubbles are forming at the edge of the pan add the cornflour and stir until the sauce has thickened until it coats the back of a spoon. Open and drain the tin of tuna, break the tuna into flakes with a fork and add to the sauce. Season with salt and pepper. When the pasta is cooked drain it and tip it back in the pot and then our over your tuna sauce and stir. Serve in a bowl with some grated parmesan or cheddar if that is what you have in the fridge. I love a good cook book, I am one of those people who will sit down with a cook book and a cup of tea and read for the pleasure of the food stories as well as to get recipe ideas. The Tamsin Day- Lewis book, Tamsin’s Kitchen Bible is one of my favorites. It is a great reference for jams, sauces, baking and meal ideas. Everything and anything can be found in this book. It is the closest thing I can get to my Mum’s Margaret Patton book which I think she got not long after she was married and which my family still refers back to. That book is tattered and marked from use and my copy of this Tamsin Day Lewis book is heading for a similar fate. The recipes are well laid out, easy to follow and I have yet to try one that hasn’t worked. Here I have used two of her recipes, with a few minor changes, one for a truly lovely tomato sauce and the other for mozzarella stuffed meat balls. 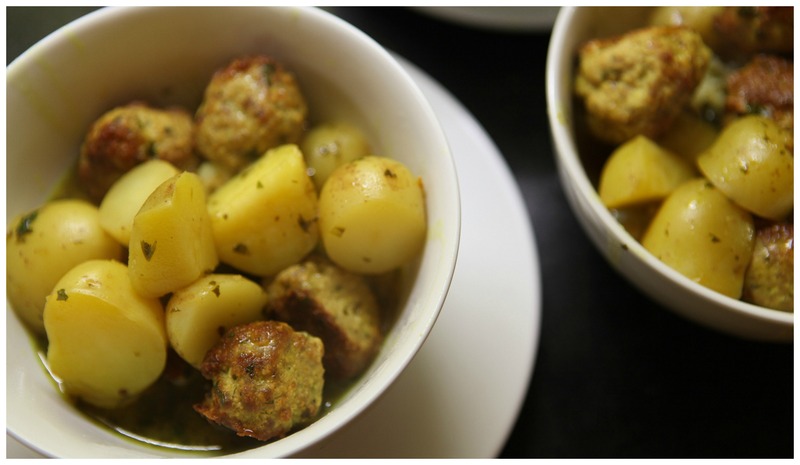 If you aren’t a fan of dairy these meatballs would be just as good without the mozzarella stuffing. Pasta is a handy starting point for a casual dinner party. If I have a few friends coming over and I know it will a long evening of lingering over the wine I will always cook something that can be served in one big bowl so people can help themselves as they chat. That way I get to enjoy the wine and the company rather than being stuck in the kitchen preparing pretty plates of food. Pasta with any sauce, augmented with garlic bread or salad, served with a wedge of parmesan and wine always goes down well. You could also serve this as a romantic Lady and the Tramp style dinner for two and freeze the left over sauce. 1 tsp fresh thyme leaves – A good trick with thyme is to keep it in a bag in the freezer as this causes the laves to fall off the stems and you can just take what you need and pop the bag back in the freezer. I ball of fresh mozarella, cut in to cubes. If you have a food processor you can mince the the shallots, garlic and parsley together. As it cuts down on washing up I simply use my beloved micro plane to grate the shallot and garlic and then I finely chop the parsley. Place in a bowl and add the mince. Add the thyme leaves, salt and pepper and the beaten egg and use your hands to combine everything. Take some of the mince in your hand, enough to make a ball just smaller than a ping pong ball. Press the meat into your palm and place a cube of mozzarella in to the centre and wrap the edges of the meat around the cheese. Roll the ball in your hand to make sure the cheese is covered by the mince. You should get approximately 24 meat balls depending on the size. Oil a baking sheet with some olive oil and place the meatballs, evenly spaced on the sheet. Put in to the oven and bake for 20 minutes. Baking the meatballs browns the meat and gives a nice texture. Tamsin Day Lewis recommends using fresh tomatoes in this sauce and if I have the time I do like to use them however more often than not I don’t have the time and so I have adjusted her recipe a bit to make up for this. A knob of butter and a splash of olive oil. Heat the oil in a large heavy bottomed pan and sauté the onions, garlic and celery over a medium until softened but not browned. And the tinned tomato, pasatta and puree. Stir in the herbs and add the bay leaves, simmer for minute and then add the sugar. I had heard about adding sugar to tomatoes before to bring our the flavor but using dark brown sugar not only gives a great depth of flavor i also gives a lovely rich color to the sauce. Simmer uncovered, storing occasionally until the sauce begins to thicken and then add the red wine, salt and pepper, stir. At this point I add the meatballs that have been baking in the oven for twenty minutes to the sauce and leave to simmer uncovered for 30 minutes. If the sauce starts to dry out add another splash of wine or pasatta. After 30 minutes add a good knob of butter and a splash of olive oil to finish. Cook your pasta. If cooking GF pasta, do use plenty of boiling water in as big a pot as you have. GF pasta tends to be very starchy and so sticks together if there isn’t plenty of room in the pot. Cook until it still has a slight bite and don’t over cook it or the pasta may disintegrate on you. Once the pasta is cooked and drained, place it in a big serving bowel and spoon over the tomato sauce and meatballs. Stir the sauce in to the pasta, making sure to keep some meatballs on top where your guests can see them. Garnish with plenty of grated parmesan and some fresh basil leaves. I like to leave to leave the cheese and the grater on the table so people can help them selves. This quantity will serve four hungry or six more reserved people but you can serve it with fresh crusty bread or garlic bread if you want to make it stretch. When I was small my cousin used to make us eggy bread for lunch when she babysat, it was quick and easy, beat the eggs, soak the bread and fry in butter, job done. I loved it then and I love it now by its grown up name of French Toast. I have made a few different versions of French Toast some more complicated than others, involving brioche or croissants and cream, lots of cream. 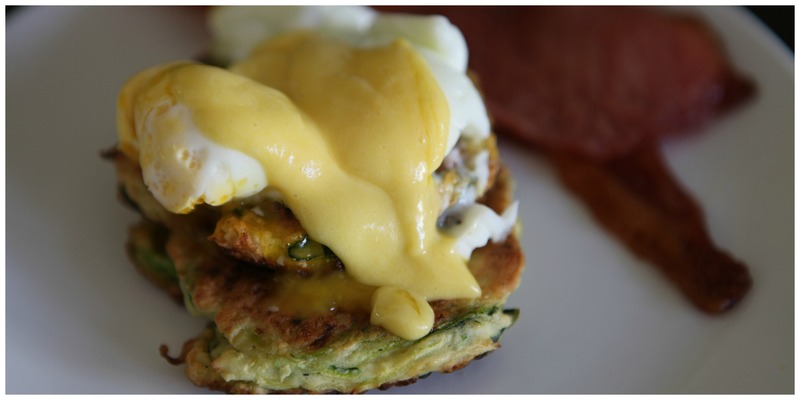 But for a quick weekend breakfast I just go back to the simple process my cousin used. Add some Maple Syrup poured over the crisp golden toast, spilling down on a slice of bacon and I am a happy camper. When I am making this for my self I use gluten free bread I have recently found that the Aldi GF bread stands up really well to being soaked in beaten egg and then fried, it doesn’t disintegrate and crisps up nicely. There isn’t really a recipe for this but as a guideline for two people with two slices of toast per person I use two eggs, beat with a fork, add a splash of cream if you happen to have some in the fridge and a bit of salt and pepper. Soak the bread in the egg mix and leave for as long as you can so the bread can absorb the eggy goodness, at least ten minutes. Heat a pan and add a good knob of butter and a drop of oil as this will stop the butter from burning. When the butter is sizzling nicely add the bread. Fry until golden and then flip to fry the other side. In the meantime grill some bacon and warm a plate. Serve the french toast with bacon and a good drizzle of Maple Syrup or the condiment of your choice. Enjoy. 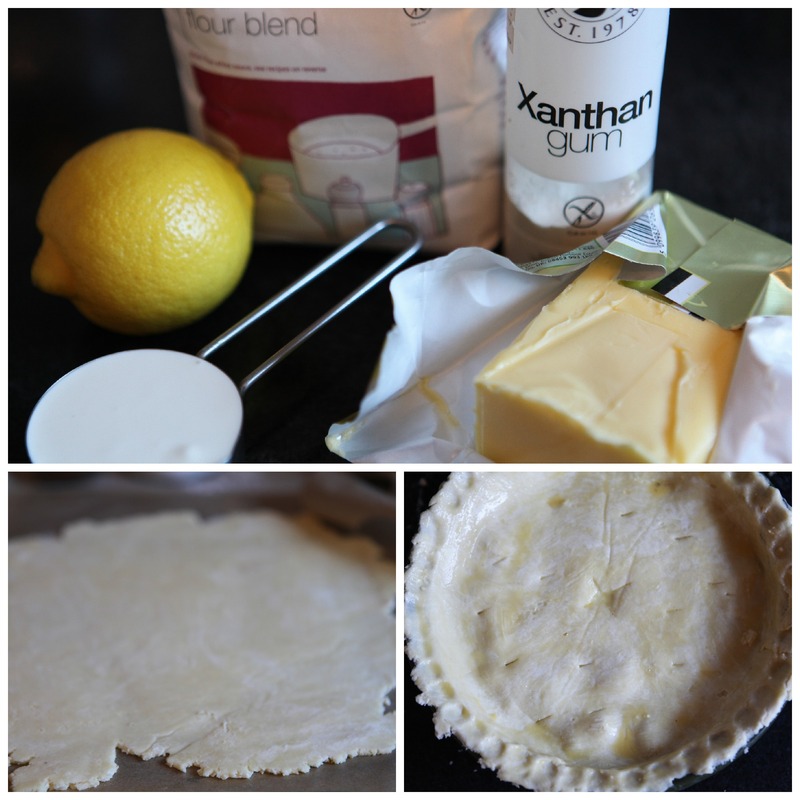 Shortcrust pastry is the simple result of combining three ingredients, flour, fat and water. It is versatile. Whether as the lightly salted lid on a bubbling savory pie, the buttery and crumbly shell of a quiche or sweet and crisp in a fruit tart, short crust pastry is a pleasure to eat. It is also a pleasure to make. Combine half the amount of cold fat to flour, rub together to create a breadcrumb consistency, add sufficient cold water to form a firm but pliant dough, leave to rest in the fridge. Roll out to fit your tin and away you go. Things aren’t so straight forward when making GF shortcrust pastry. Pastry works because of the gluten in the flour, this is what gives dough it elasticity, you rest and chill dough to allow the gluten to relax, other wise your dough will shrink in the tin. Without the gluten therefore the process is a little more complex. The first thing I learned to bake GF was pastry. I now have a few different recipes in my repertoire but I the one i most frequently use is shortcrust. The basic rule still applies, half the quantity of fat to flour, you just need to add an extra ingredient. Xanthum gum, this provides the stretch that GF flour lacks. In recipes on this site (unless stated other wise) I will always use the Doves Farm GF flours, I am familiar with them and they work for me, I also use the Doves Farm Xanthum gum as it is readily available in most health food stores. My fat of choice is butter, occasionally half butter, half lard, but never margarine, I am sure margarine has its place but I firmly believe that place is not in a baked good. It aggrieves me deeply when I am asked to fork out near €4 for a single brownie that has been made using margarine and its insidious cousin, cooking chocolate. Seriously, producers of gluten free treats I know you need to keep costs down given the exorbitant cost of GF flour but give me real chocolate and real butter, please. This is the quantity I would make to line an 8″ or 9″ tin. 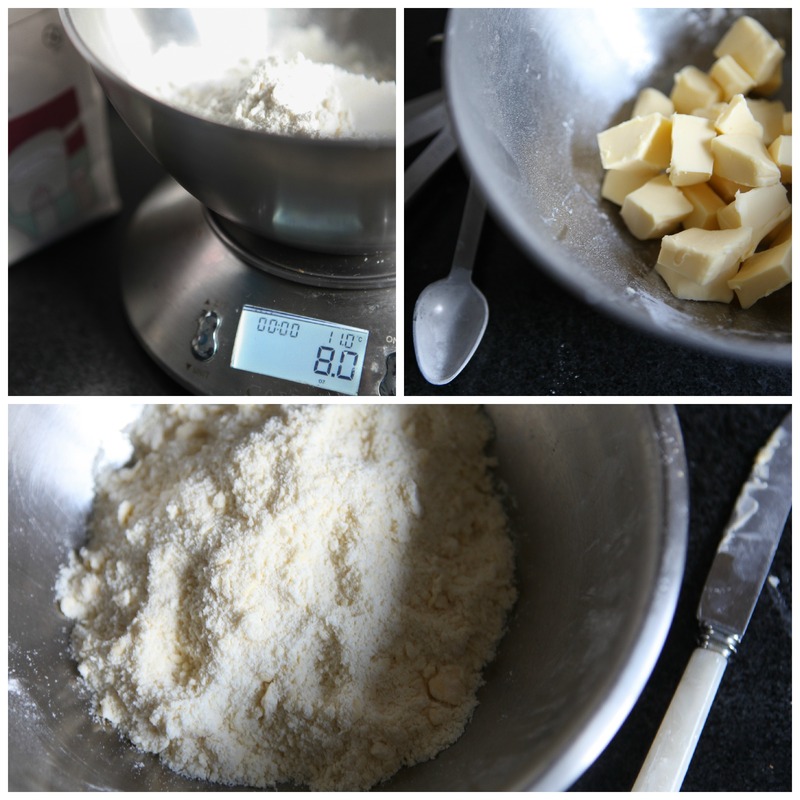 To make a sweet short crust pastry stir in 2 oz/ 50g caster sugar to the mix when it is at the breadcrumb stage. In to a bowl sift the flour, xanthum gum and salt. Add the chilled butter and rub in to the flour mix, use the tips of your fingers and be gentle. 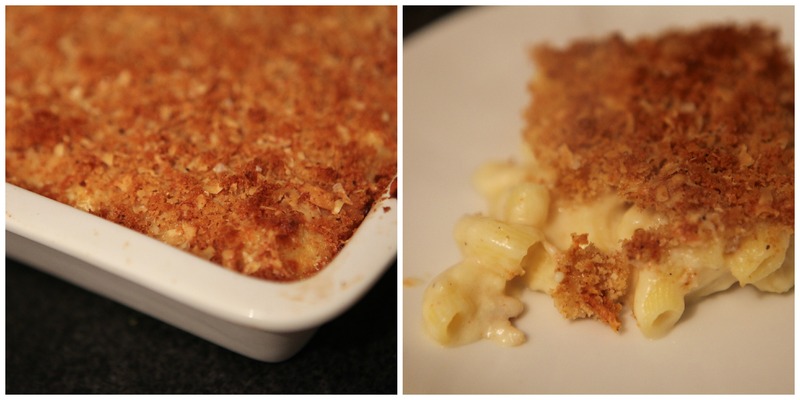 Mix until you get a texture like breadcrumbs. Make a well in the centre and add the iced water a tablespoon at a time. Mix with a fork or your hands until the pastry comes together.The pastry should have come together in a ball but should not be sticky. It will take a few attempts until you can tell by the feel if you have added enough water or too much. Pat the pastry in to a disc shape and wrap in cling film if you are going the chill it. If you have time I would advise chilling the pastry however there have been occasions when I have been known to roll out the pastry straight away, particularly if I have rocked in from work after 19.00 and I am making a pie or a quiche for dinner. When I am hungry rules can get relegated down to guidelines. To roll out the pastry I use two squares of baking parchment or cling film cut larger than the size of my tin, this will make your life much easier than if you try to roll out the pastry on a floured work surface. GF pastry is fragile and given to disintegrating when you try to lift it from work surface to tin. 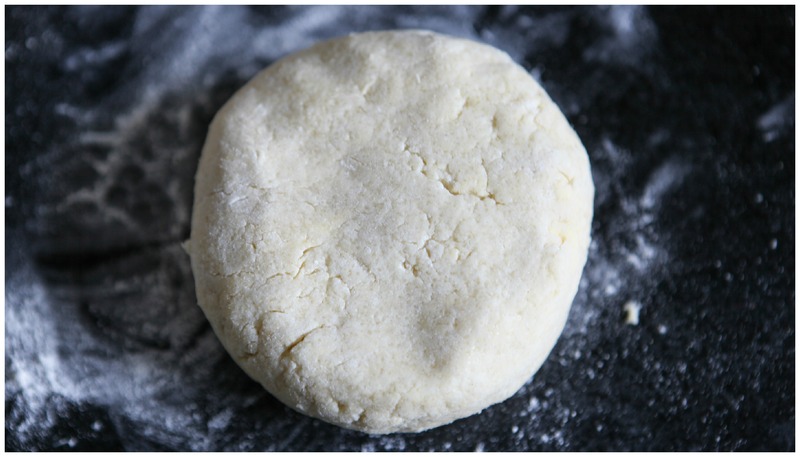 Place a square of cling film on the work surface, place your pastry disc and cover with the other sheet. Roll the pastry to the desired thickness and size and then remove the top layer of cling film. With great care lift the pasty on it’s bed of cling film and slide your hand underneath and bring it next to your greased tin, with even greater care turn the pastry over and lay it into the tin. While you can use baking parchment, cling film can be easier to use as it is softer and easier to manoeuvre when you are placing the pastry in the tin. Lightly press the pastry in to the tin, it may break, to be honest it most likely will, so don’t be disheartened, slowly peel back the cling film. If the pastry has made it in one piece, well done, if not you can now set about filling in holes and smoothing over cracks.